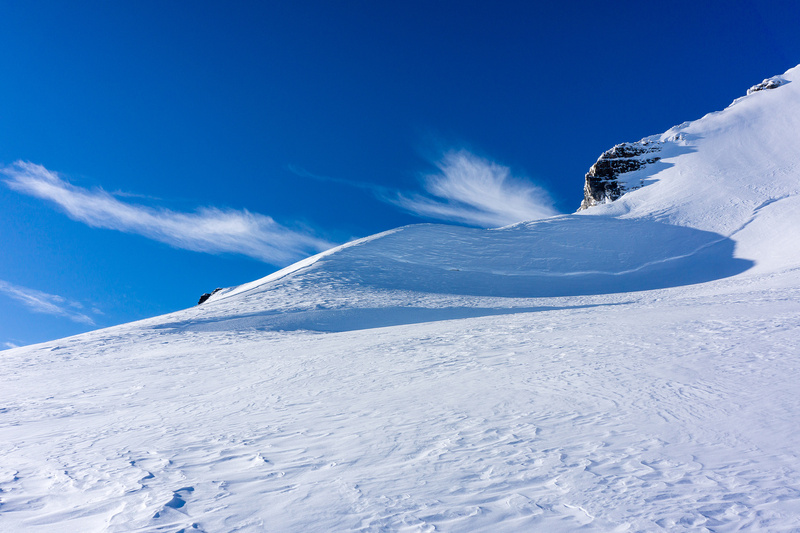 Quick ‘n Easy Rating: Class 2/3 – You fall you sprain or break something unless you fall into a crevasse or get caught in an avalanche. Then you might die. 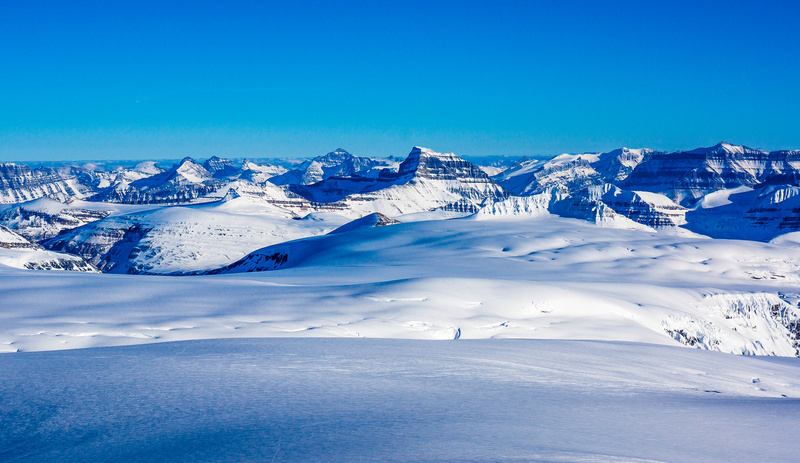 Difficulty Notes: The Saskatchewan Glacier approach to the Columbia Icefields is much safer than the Athabasca Glacier headwall approach but is still a serious winter undertaking to approach and camp on the icefields. 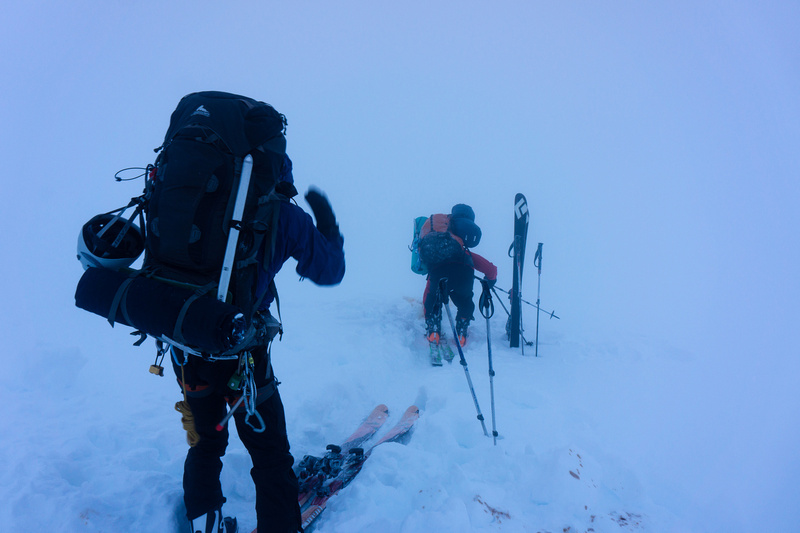 We made it to around 11,000 feet on Mount Columbia on its south ridge and had crevasse and avalanche hazards to deal with. 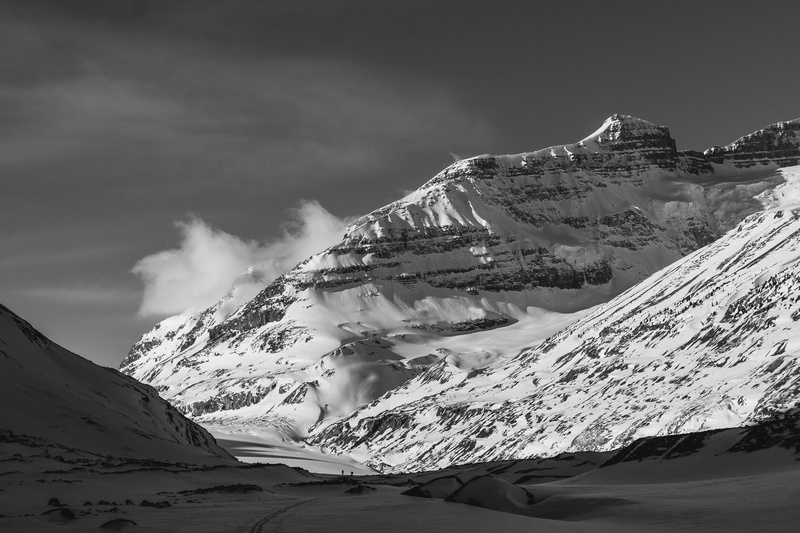 Traveling on the Columbia Icefields before March / April is not the safest time of year to be up there. Most years it’s best to wait until April or May for really good coverage and much longer days and warmer temperatures. 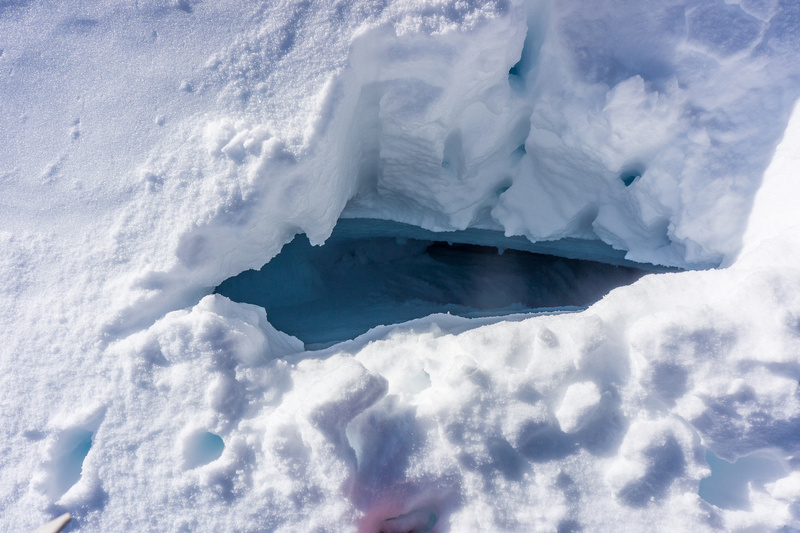 We definitely played fast and loose with crevasses on this trip. There are huge, scary, deep, killer holes up there – including any of the ascent slopes on Columbia herself. Proceeding up that ridge unroped was a very silly thing to do! Thinking we could “bag” Columbia from our camp near Castleguard in February was very silly too. 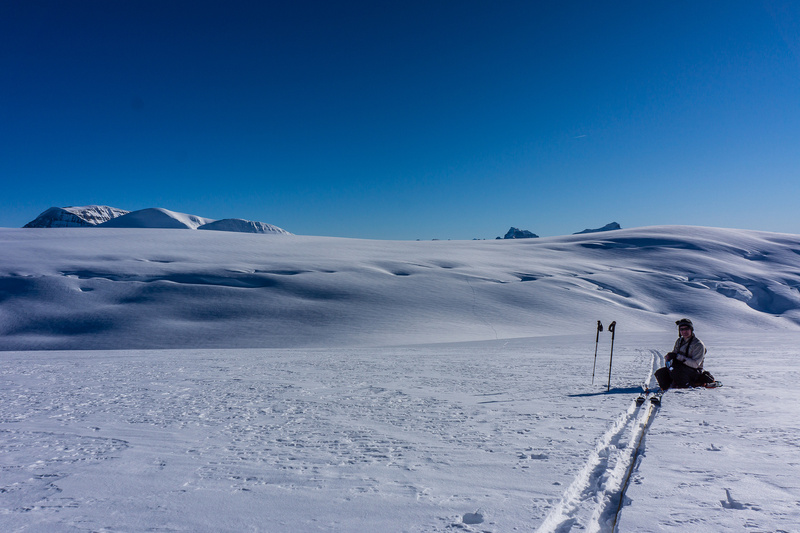 It’s a huge distance, very crevassed through the trench, consisted of short day light hours and cold nights, not to mention crappy mid-winter snow conditions. On hindsight we were very lucky to escape with no summits and nothing worse happening. Skiing back to our camp from Columbia unroped in the dark was also not smart. 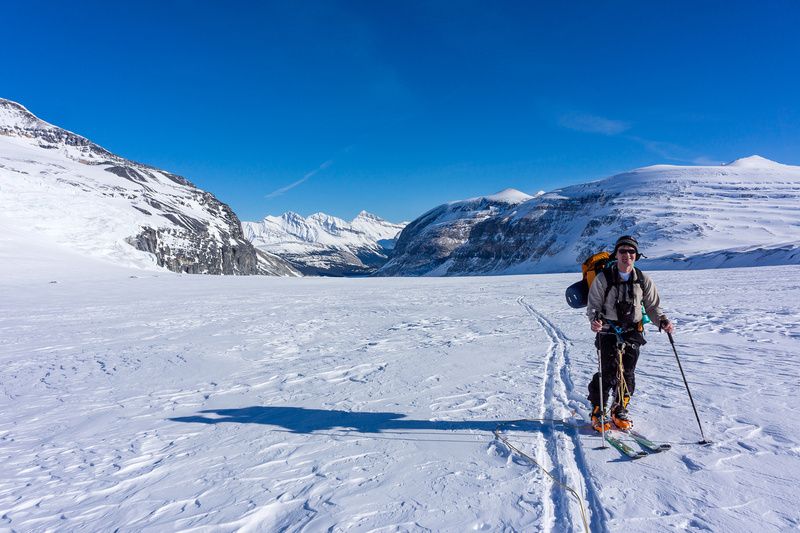 I’ve skied many times on glaciers unroped and I’m questioning the sanity of this move – especially on the Columbia Icefields. It’s not worth dying for. Is it? Mount Columbia via the Saskatchewan Glacier – APPROXIMATE Route Map. Note the X’s marking our failed Columbia and Castleguard attempts from base camp. 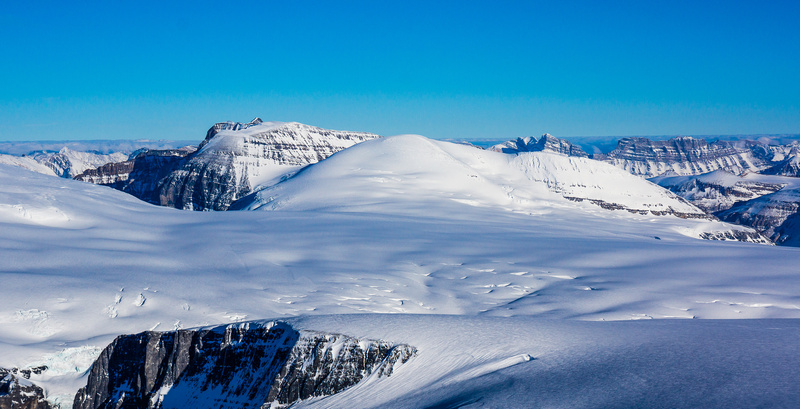 After a few back and forth emails I found myself planning a trip to the Columbia Icefields with So and Ferenc for an attempt on Mount Columbia and a possible shot at Castleguard Peak. 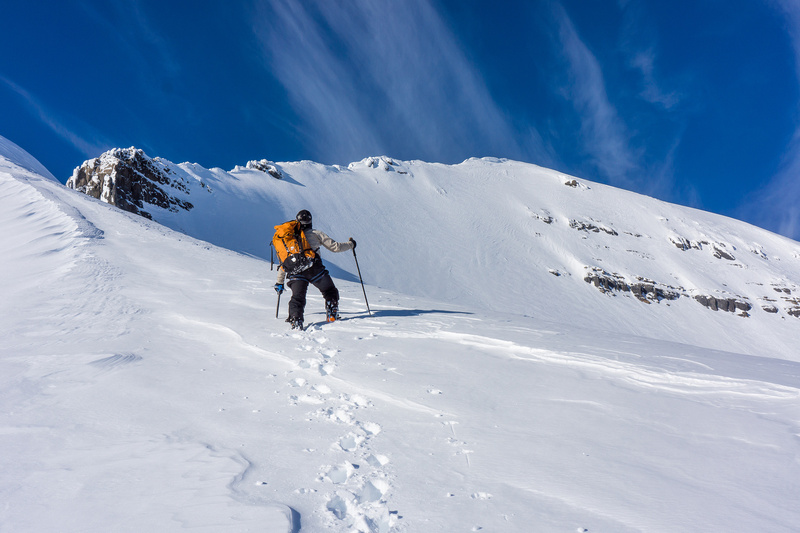 This would be a serious winter ascent of Alberta’s highest peak (12,274 feet) which is infamous for being technically ‘easy’ when in good shape but with a serious bite of avalanches, hidden crevasses and temperamental weather conditions when not. 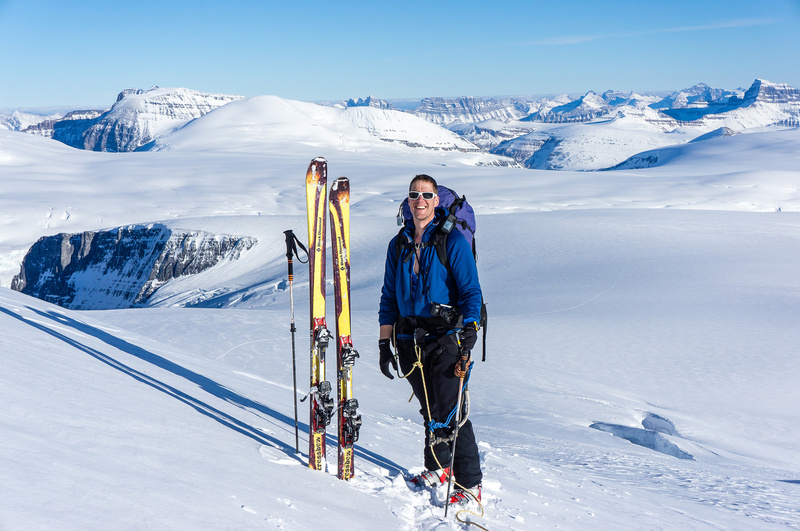 Castleguard is a comparatively easy ascent, but has the same ‘bite’ as any peak on the icefields, you need a good weather window and good snow combined with a bit of luck or you’re not going to summit. Snow conditions on the glacier itself. i.e. are you breaking trail or is there an existing one? 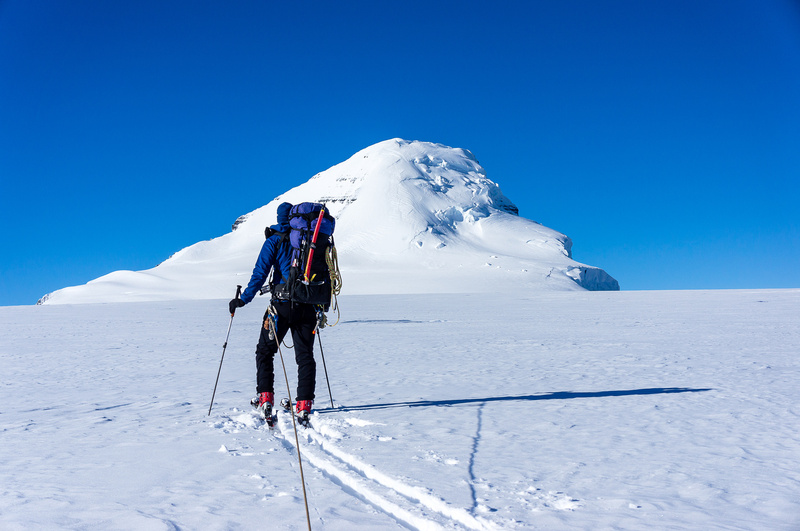 Is the snow surface hardpack or soft? Snow conditions on the final 400-500m ascent slops regardless of avalanche conditions (normal east face or southeast ridge routes). Is it hard snow, ice or soft snow? Condition of the ‘schrund. Is it filled in? Barely covered? Approach distance. Lines on a map look so easy! 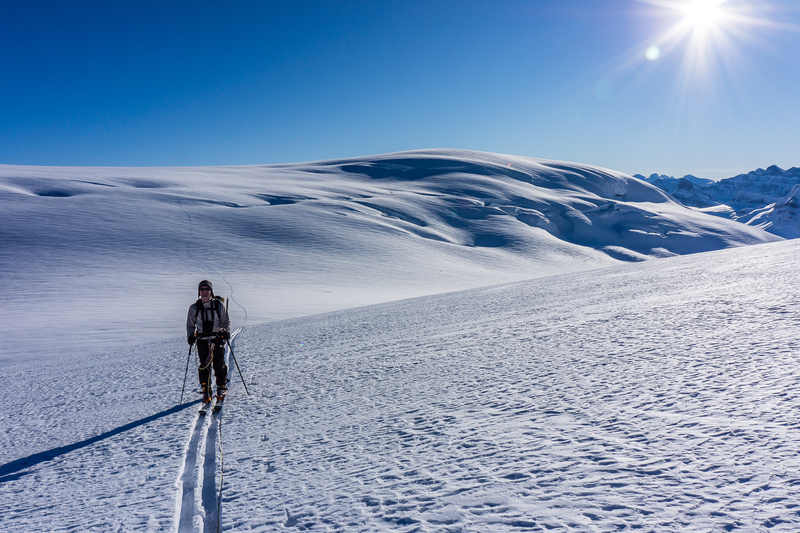 Skiing 20km with an over night backpack with winter and mountaineering gear is a lot of work. 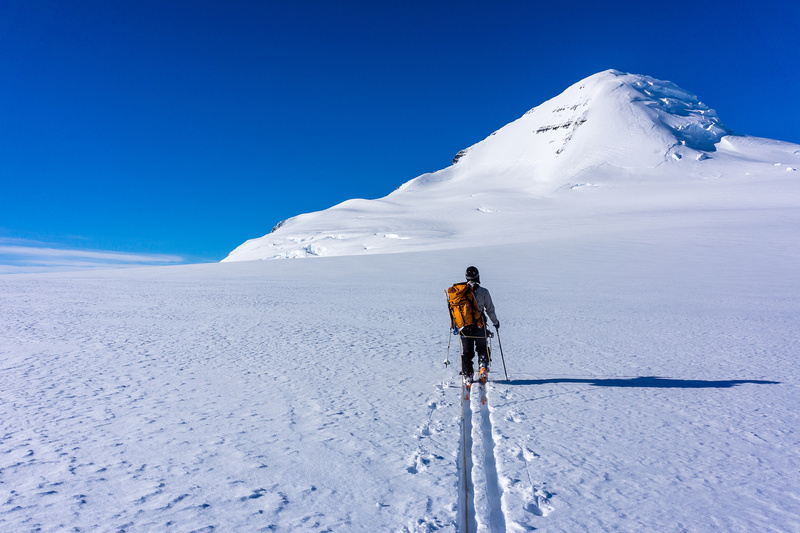 We should have known that there’s a reason Columbia is considered an April, May or June ascent and is rarely ascended in the middle of winter and even more rarely from the Saskatchewan Glacier approach in winter. 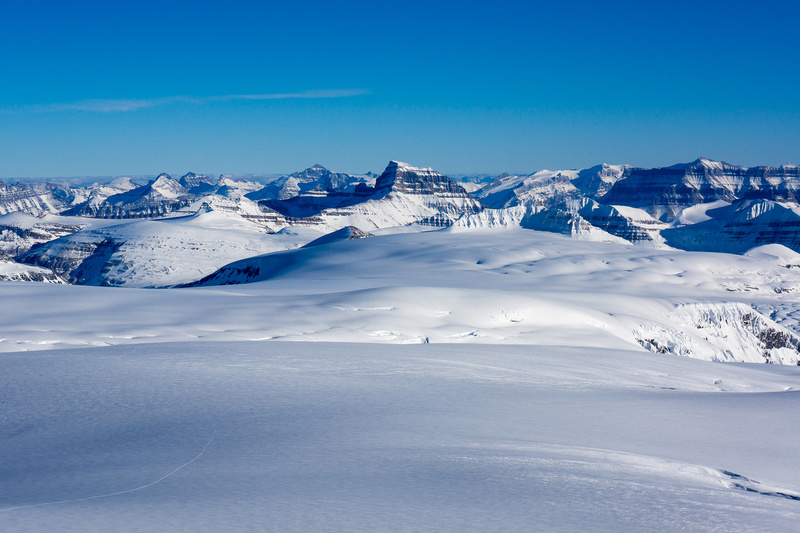 I assumed that with the great weather forecast of light winds, clear sky and very reasonable avalanche conditions, the Columbia Icefields would be a busy place. Boy was I wrong!! 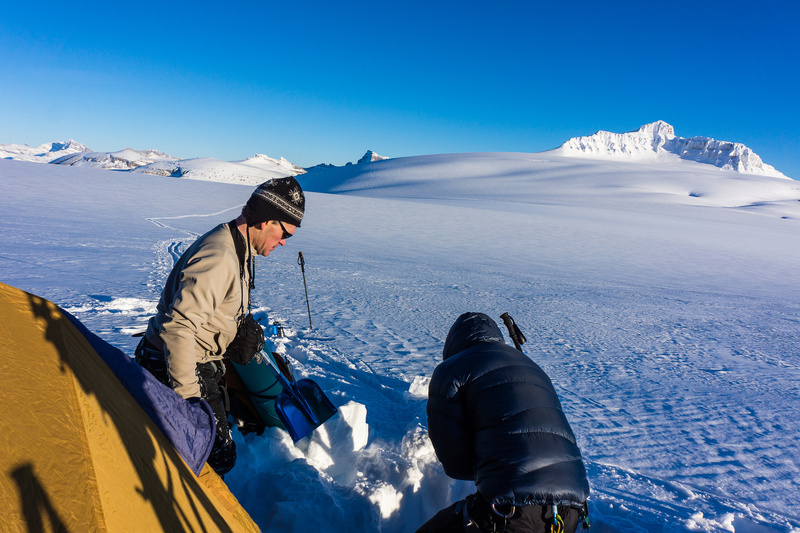 To make a long story short, we ran into a trackless glacier (we broke trail all the way up the Saskatchewan Glacier and from our camp to Mount Columbia), snow that was up to our ankles and to top it all off, a ‘schrund where there shouldn’t have been one. 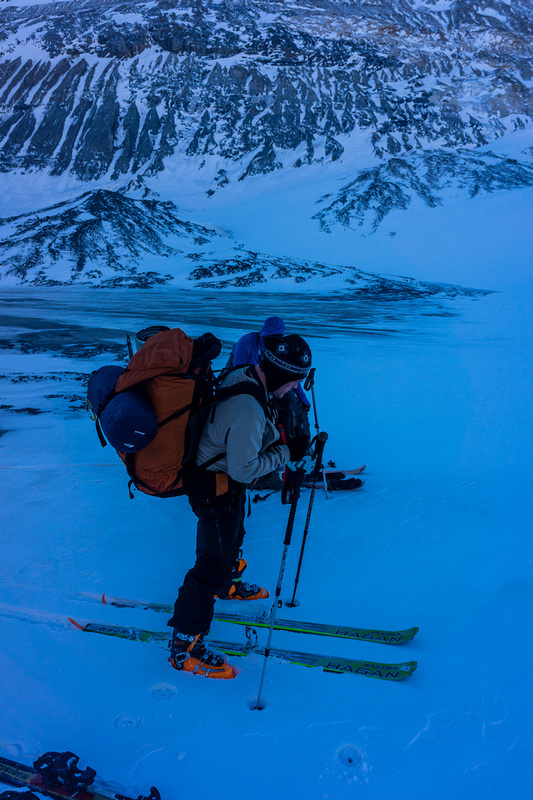 After 30km of skiing and nearly 2000 meters of height gain we found ourselves over 11,000 feet on Mount Columbia’s Southeast ridge staring into a black hole with the sinking realization that this quest was over for us. But I’m getting a bit ahead of myself. At the early morning hour of 03:30 I met Ferenc and So in front of Ferenc’s house. We must have been excited because within 6 minutes the truck was loaded and we were off! I was just thankful that my migraine of the night before was gone – that was some bad timing, or really good timing that it didn’t wait a day or two. 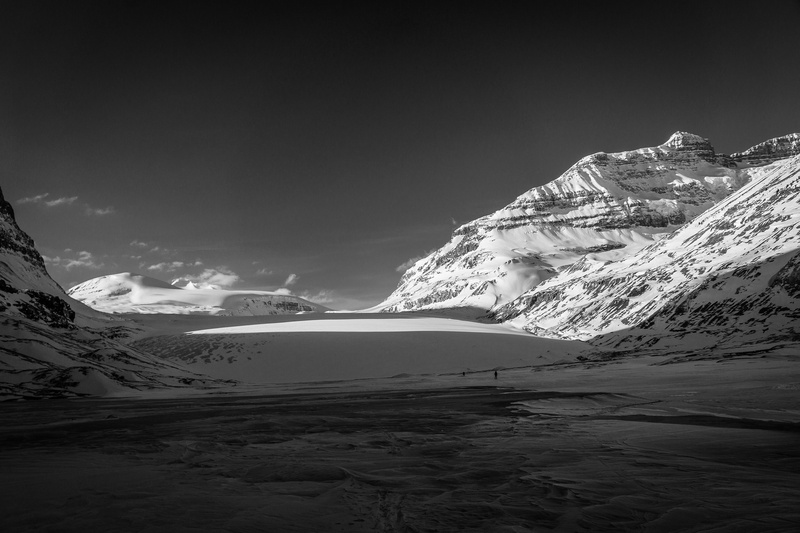 There are different options for the approach / egress to the Columbia Icefields. 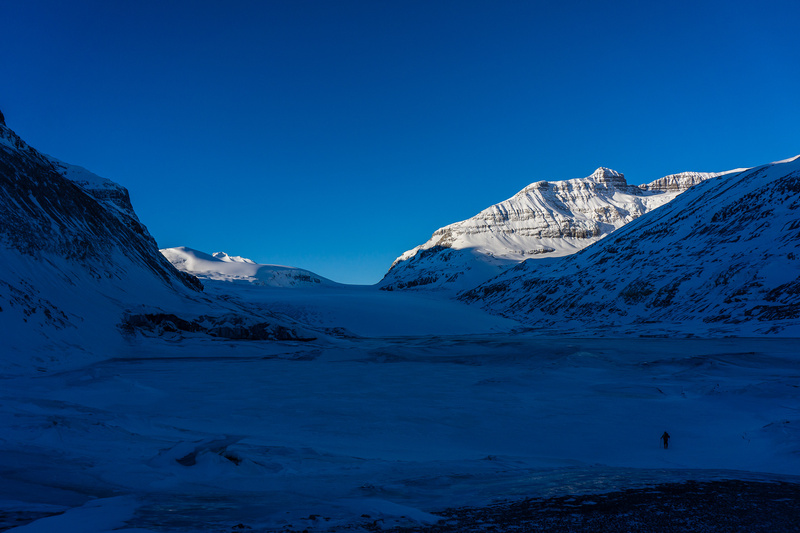 The safest / quickest option if you know where you’re going is to ascend the Athabasca Glacier and exit via the Saskatchewan. 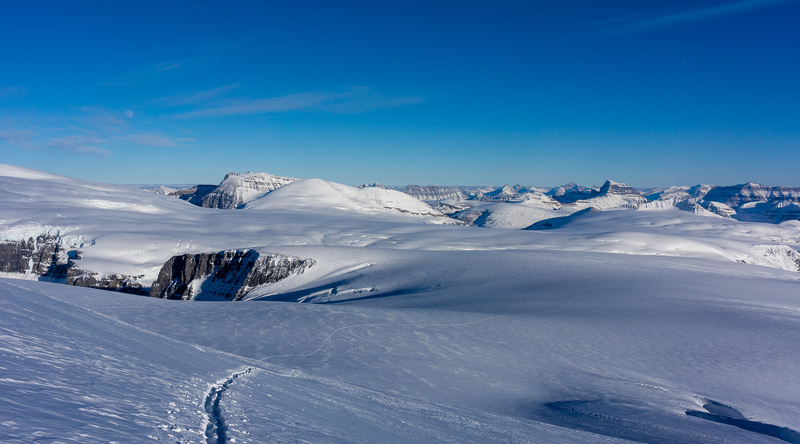 The Athabasca approach is quicker for every peak on the icefield except Castleguard but has much more objective hazard from both icefall off of Snow Dome and crevasses on the headwall. 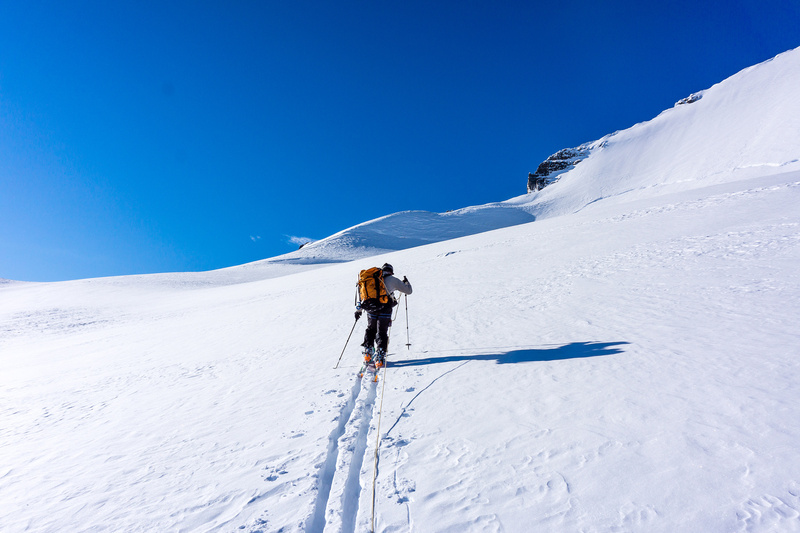 Descending the Athabasca safely requires roped skiing which isn’t easy even for good skiers. 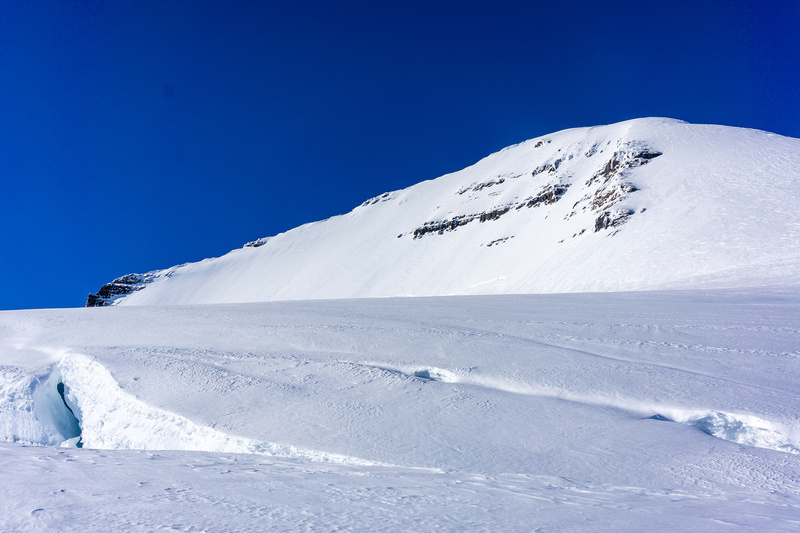 More accidents seem to be happening over the last few years – possibly due to the glacier changing or simply people underestimating the dangers of the headwall. 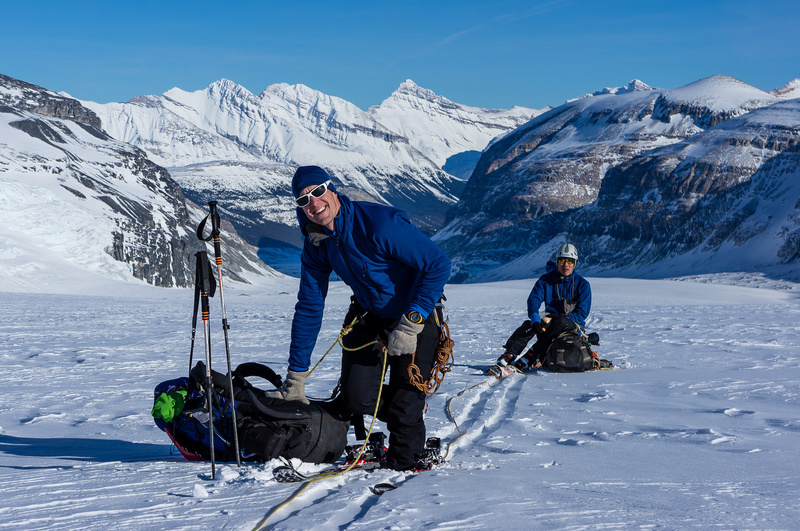 Because none of us had ever been on the Columbia area glaciers before and due to the fact that Ferenc did not have a high comfort level or experience on back country skis, we decided to do the safest route possible – both ascending and descending the Saskatchewan Glacier. On hindsight I’m very happy that we erred on the side of caution! As we approached the Saskatchewan Glacier the terrain became much ‘wetter’ – of course it was all ice now but I would think that in the late spring / summer / fall this makes the approach to the glacier MUCH more involved. The drive went by quickly with stories from Ferenc about living in Hungary and Denver and before long we were parked at the Big Bend parking lot on highway 93 looking at a pair of ski tracks disappearing over the snowbank next to the parking area. This was a big relief since none of us knew exactly where the old bridge over the North Saskatchewan River was, and with all the snow next to the highway and the darkness (it was only just after 07:00) we had no hope of finding it easily either. 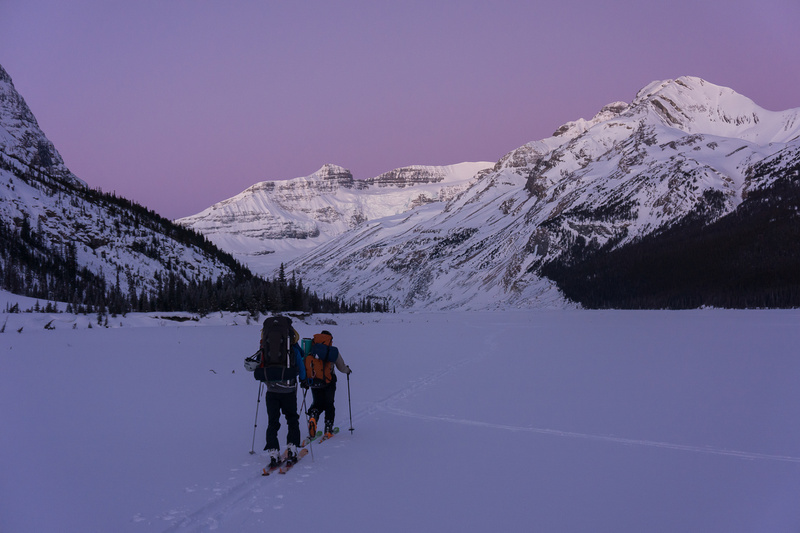 As we struggled into our heavy winter camping backpacks and followed the tracks over the snowbank we could only hope that they crossed the river – and thankfully they did. 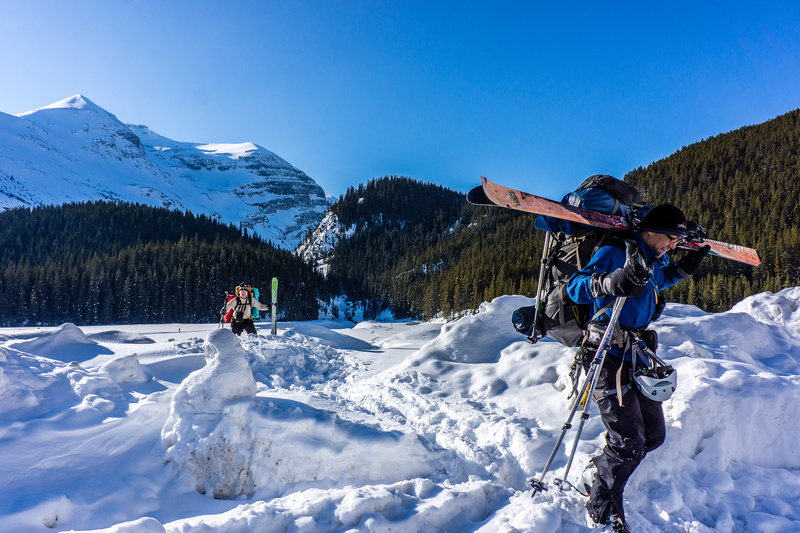 We found and followed ski tracks up the old road around the canyon and back down the 75 meters back to the valley floor and the North Saskatchewan river. 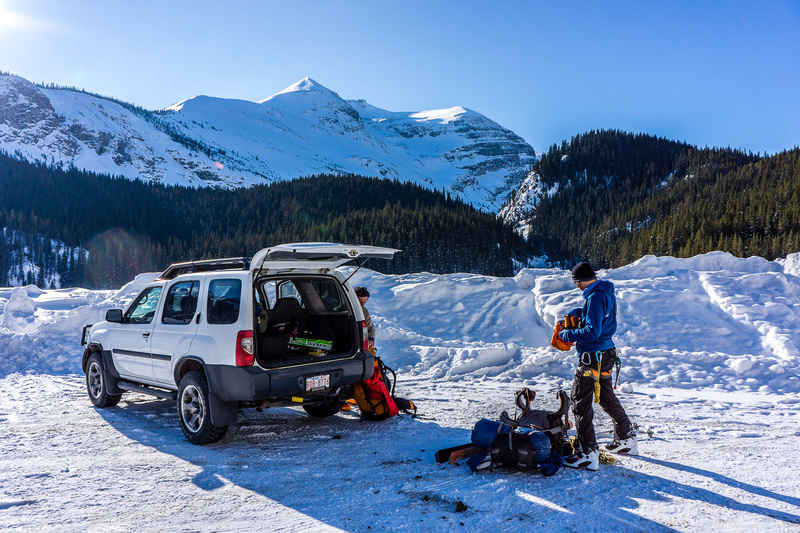 I’ve read some accounts on the approach to the Saskatchewan Glacier in spring and summer which include crossing a raging river over a bottomless gorge on a stack of loosely piled logs – but the winter approach is very easy in comparison! We simply skied up the valley a little on skier’s left, crossed a lake or two and some pretty cool ice jams on the way and ‘bumped’ into the glacier at the end of it. Easy stuff so far. 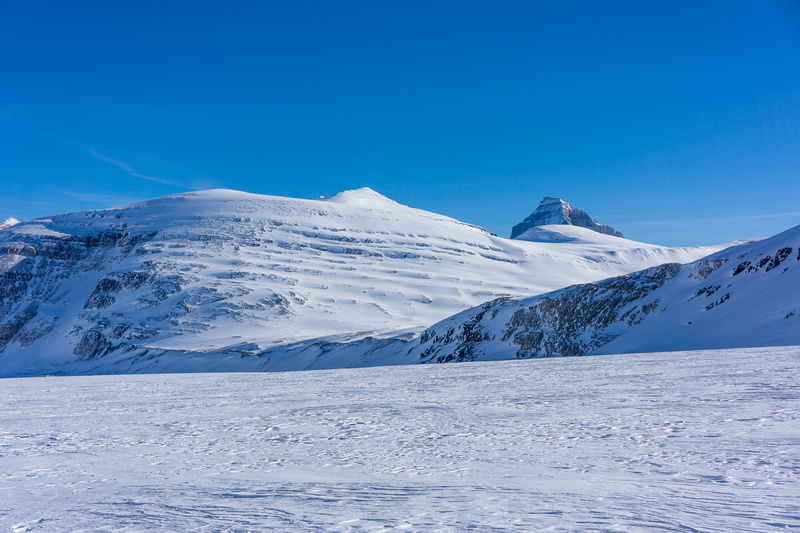 Approaching the Columbia Icefield neve and col between Castleguard (L) and Androlumbia / Andromeda (R). 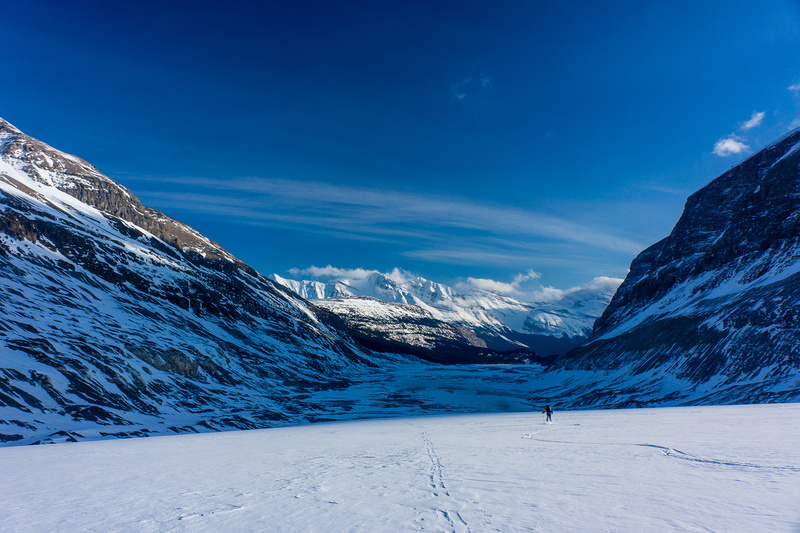 The Saskatchewan Glacier was easy travel for the first 2km on hard pack snow. 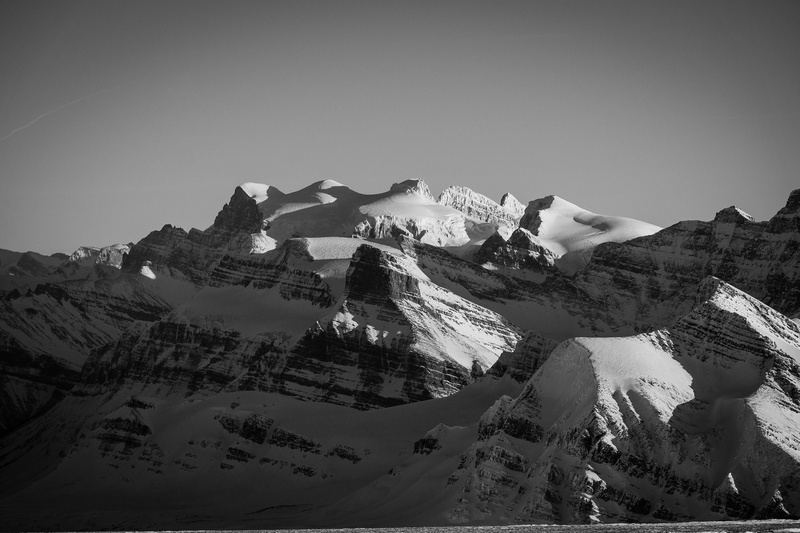 It was quickly becoming apparent that all the peaks on the icefield move away from you as you approach them. They must be shy or something. As we slowly picked our way up the wide Saskatchewan Glacier, Castleguard and the Castleguard Meadows never seemed to get any closer! 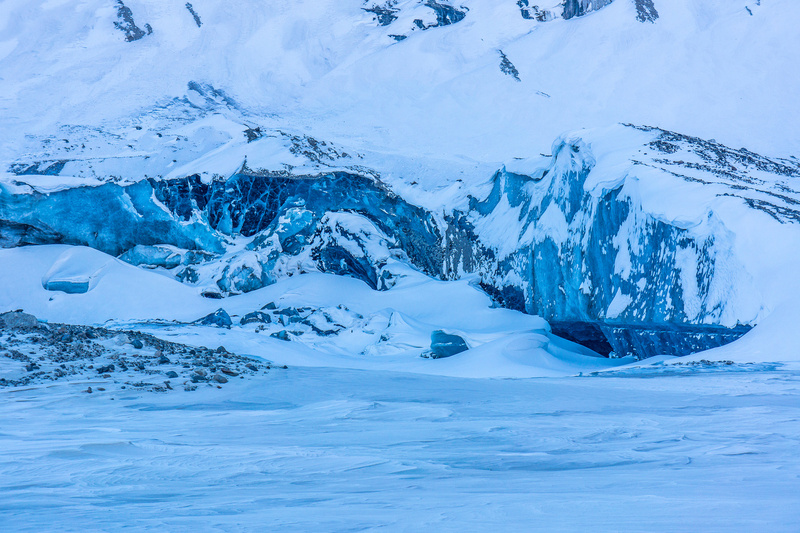 Eventually we shuffled slowly past the meadows and could finally see around the lateral moraine on our right at the crown of the glacier far in the distance above us. Just before the Saskatchewan Glacier runs into the main massif of the Columbia Icefield (there are 6 main glaciers comprising the Columbia Icefields, the Athabasca, Saskatchewan, Castleguard, Dome, Stutfield and Columbia – see this map for more details), it steepens considerably. I think this is where So and Ferenc tired themselves out breaking trail. Since I was in the middle of the rope I got lucky on day 1 with little trail breaking duties. So’s hip flexers started giving him problems and we decided to call it quits somewhere under the impressively rimed north face of Castleguard with views of Bryce, Columbia and Andromeda thrown into the mix. Castleguard Mountain is striking with the ice-rime plastering it’s impregnable north face. We dug out a nice, cozy little camp and set about making supper and staying warm. 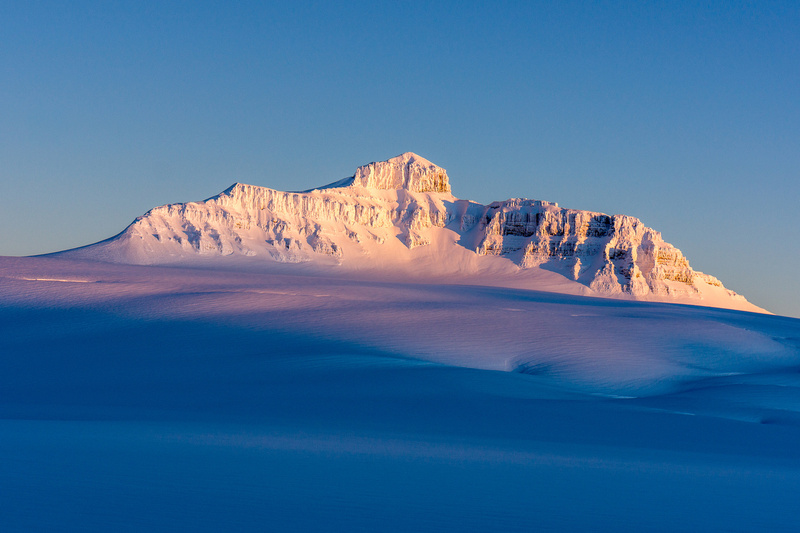 The temperature dropped to about -10 once the sun set over Mount Bryce. The sunset views to the east were crazy, with bright hues of purple-tinged sky below an orangish glow. With the almost-full moon it was a very impressive sight which we all enjoyed immensely. We were in bed by around 19:30 and I inquired about setting my alarm. 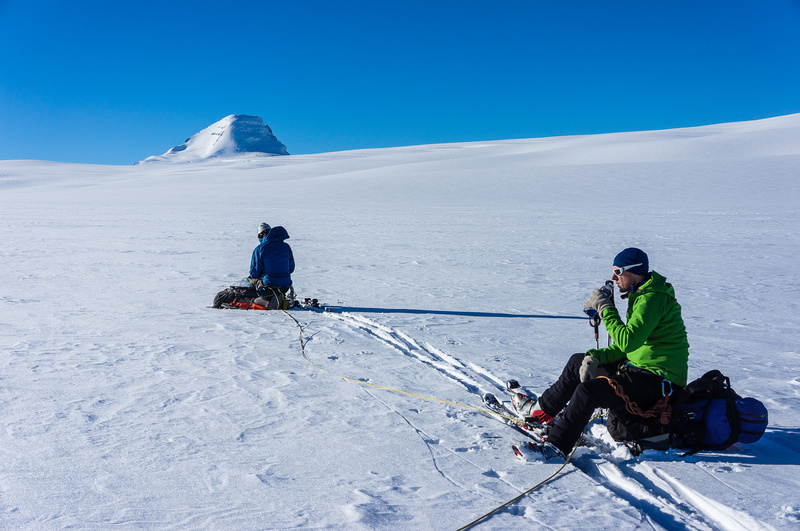 Ferenc replied that he would “never sleep more than 8 hours” so we didn’t have to worry about getting up early for an attempt on Mount Columbia. I must have been tired because I didn’t set my alarm “just in case”. Panorama of our cozy camp. On the left is Andromeda and on the right is Castleguard. 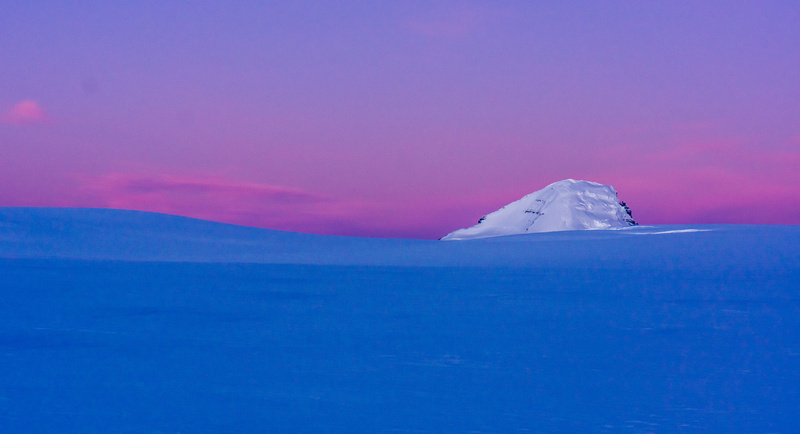 Brilliant sunset colors on Mount Castleguard as seen from our camp. I think the ascent route from here would go up on climber’s left and contour around the summit block to the right. An incredible evening view of the moon with Castleguard Mountain from camp. Another mistake was not melting all our water for the next day. NEVER save this task for ascent day if you have a choice. ALWAYS boil water for the next day beforehand. Another lesson learned! Crossing an avy slope on the way down from the road that accesses the Saskatchewan Glacial Valley. Crossing the lake, it's still early morning. 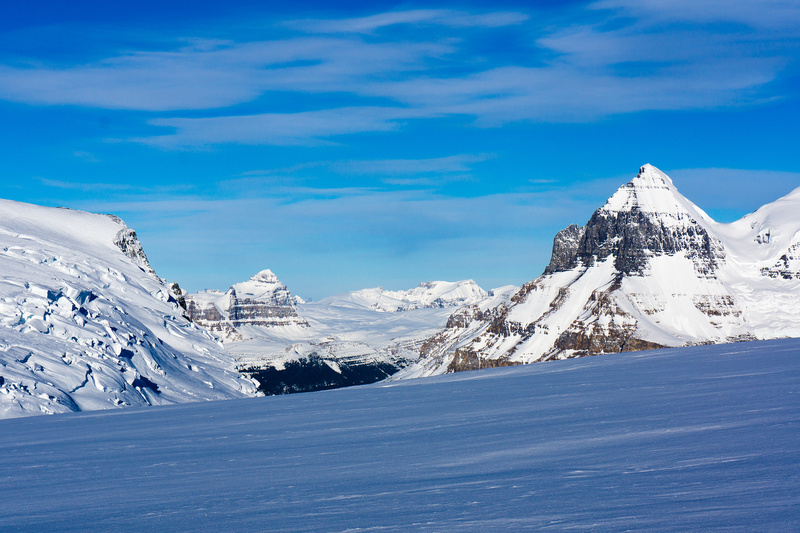 On the right in the foreground is an outlier of Mount Athabasca. In the right background is Mount Andromeda. 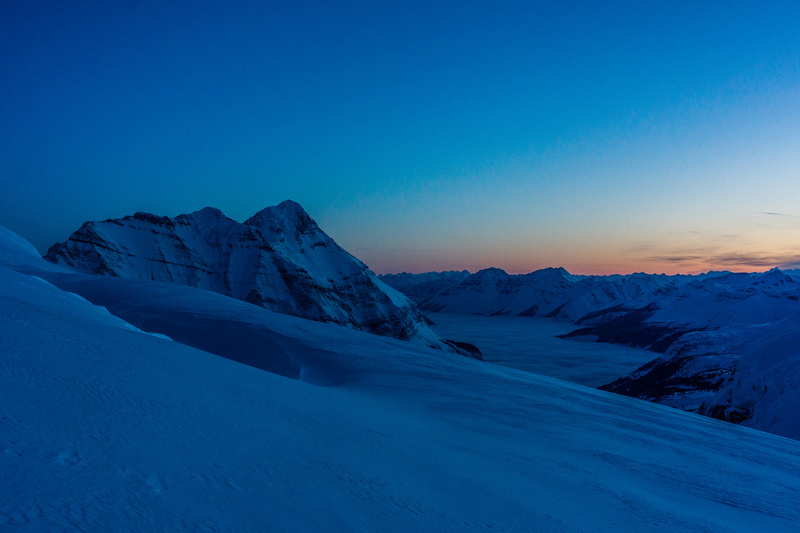 Sunrise on Andromeda and Athabasca as we can now see the Saskatchewan Glacier in the distance. Ferenc is crossing a glacial outflow lake here. 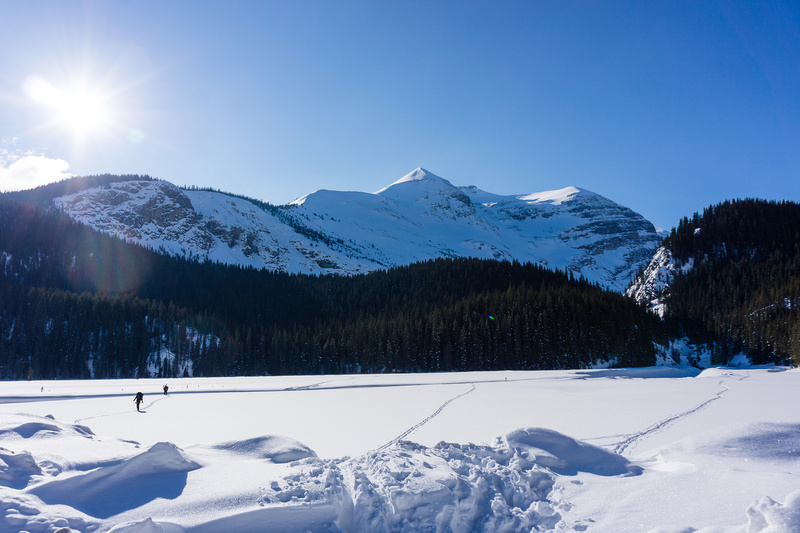 Another shot of the lake with more of Mount Athabasca on it. 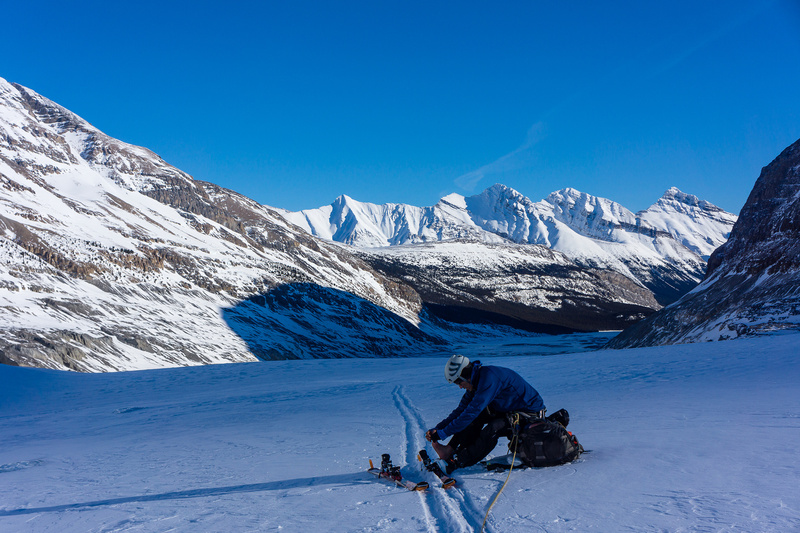 Skiing up the Saskatchewan Glacier. Looking south at the access to Castleguard Meadows. 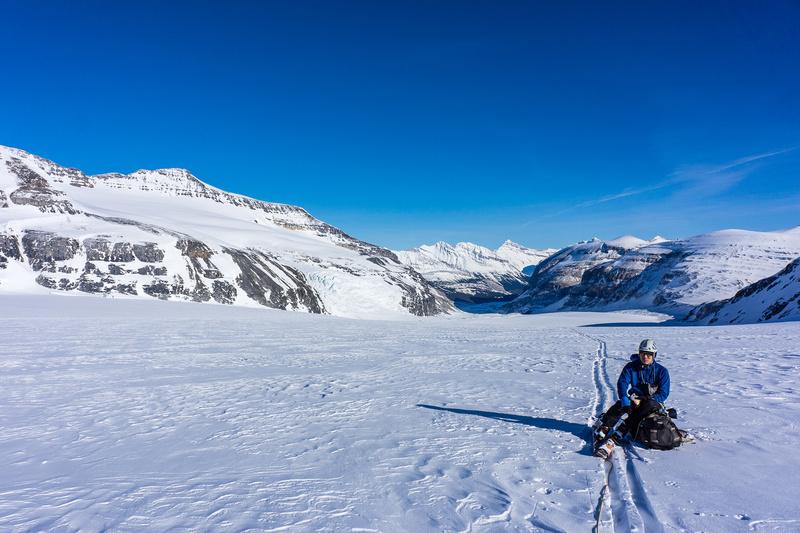 Taking a breather on the Columbia Icefields. Mount Columbia is many kms distant. 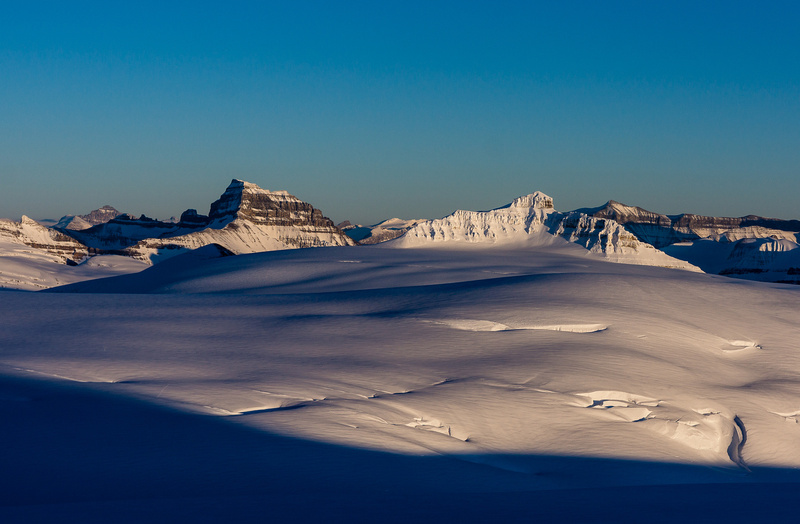 Camp on the Columbia Icefield. So eating supper with Mount Bryce showing up behind him. Sunset panorama from camp looking south and east. Castleguard in the middle and Mount Bryce on the right. 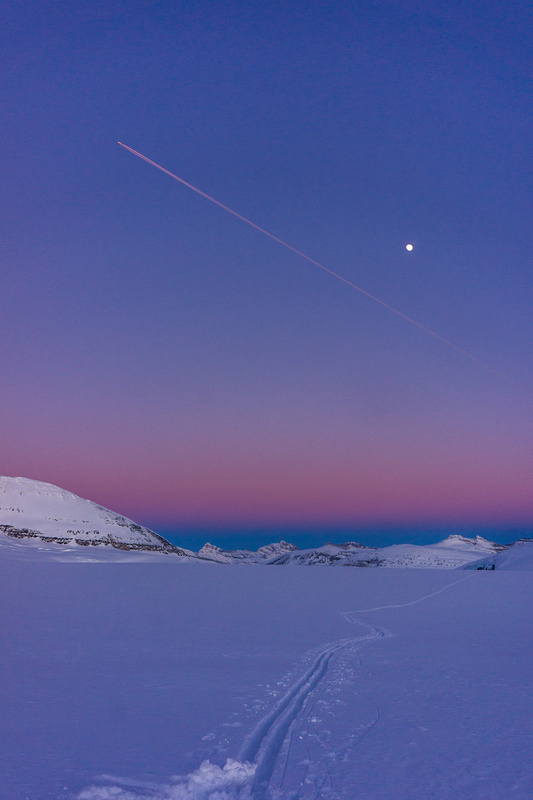 Our approach tracks with the moon and a plane catching the setting sun. I slept pretty good in my new -20 sleeping bag, waking up every hour or so to shift around. I was sleeping with my boot liners in a mummy bag so there wasn’t a ton of room in there. This worked really well for drying them out over night and warming them up for the morning though. It turns out that we all slept too good! Ferenc woke us up and informed the tent that it was already 07:00!! I was instantly quite angry with myself for not setting my alarm. I won’t make that mistake again. 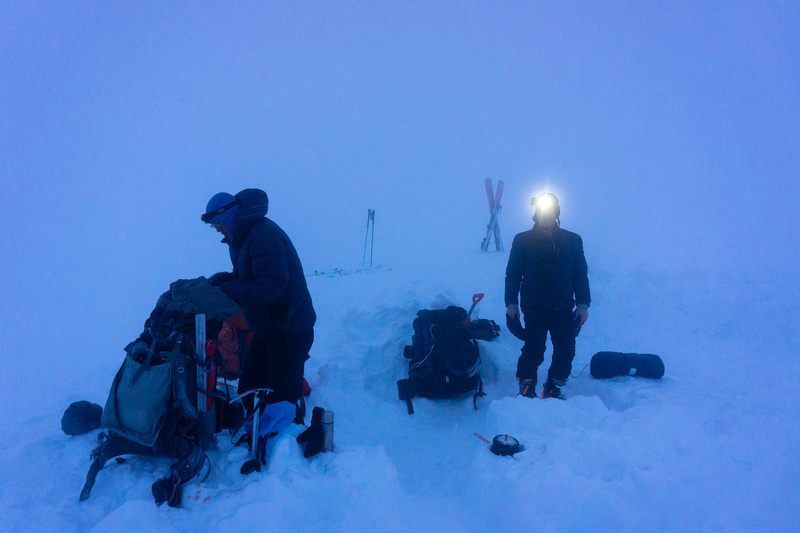 We knew that we had a full moon and good avalanche conditions so we weren’t too concerned with descending Columbia and returning to camp in the dark – we were actually counting on it. Another thing that sort of annoyed me was the hour or more that it took to leave camp after waking up. We had to boil water for the day and this took a long time even with two stoves going. 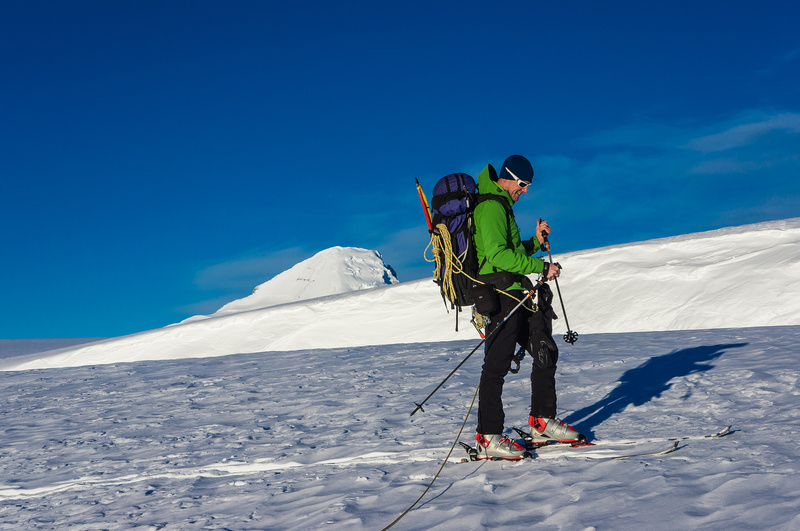 Our late departure didn’t ruin our summit chances on this particular day but it easily could have and I won’t let myself sleep in again on a summit day! 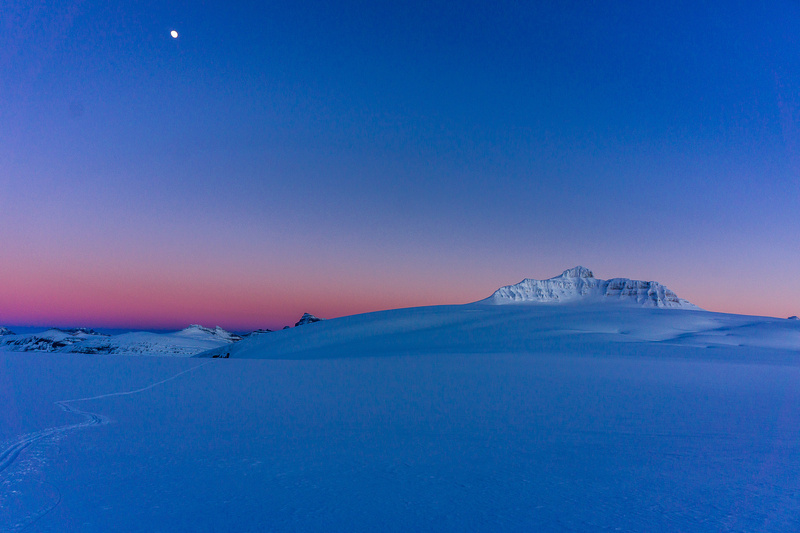 Sunrise over Mount Columbia – many kilometers distant at this point. 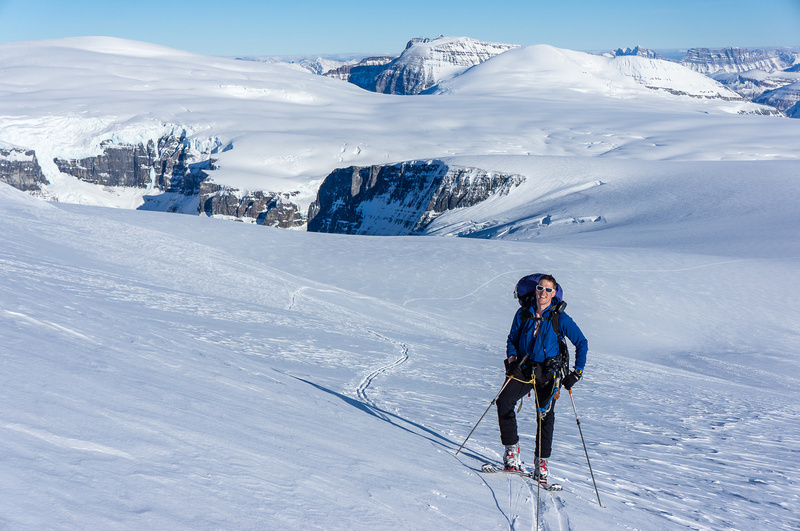 Skiing past a set of massive holes, looking back at Androlumbia (C) with the Saskatchewan Glacier lip above Ferenc’s head here. The next 9 km were beautiful and tough. 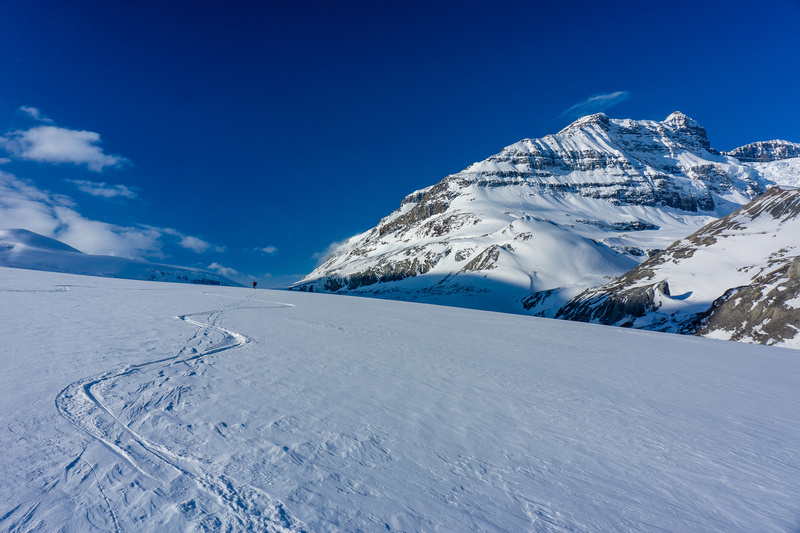 I think we were the only ski team on the entire Columbia Icefield! This was both awesome and tiring. Awesome because we were alone in a huge expanse of snow, ice, rock and sky and tiring because we were breaking trail the entire way. Just before reaching the trench I started running low on energy. I probably didn’t eat enough and that, combined with the deep trail breaking just wore me down mentally. I wanted to turn around since I didn’t think we’d summit anyway. Ferenc talked me into skiing “just a bit further” and by the time we were down the trench and had some lunch my energy levels were improved. The view of Mount Bryce and the Twins from the trench was very impressive. 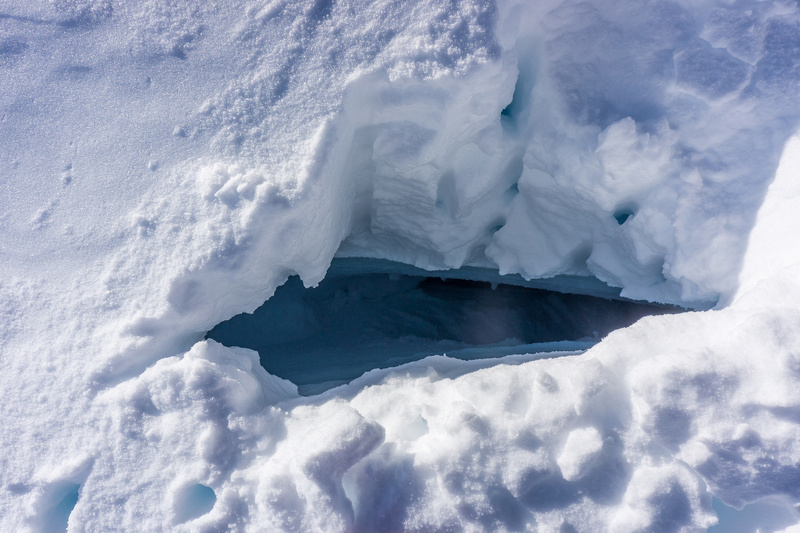 There were a lot more crevasses than I was expecting on both sides of the trench and we carefully wove our way through them. Another panorama from the east side of the trench. Bryce on the left, Columbia in center and the Twins on the right. The fighter jet we saw flew in from Bryce and dove into the trench just in front of us (we were above the jet on Columbia when we saw it) and disappeared below the Twins! I broke trail up the 200m from the bottom of the trench. At one point Ferenc was asking me to slow down, so I think my lunch break must have helped! Ferenc and I took turns breaking trail in boot top snow from the top of the trench slowly towards Mount Columbia in beautifully warm and clear weather with a very slight breeze cooling us off. Before you think the journey to Columbia is over once you’re done re-ascending the trench – it’s most certainly not. 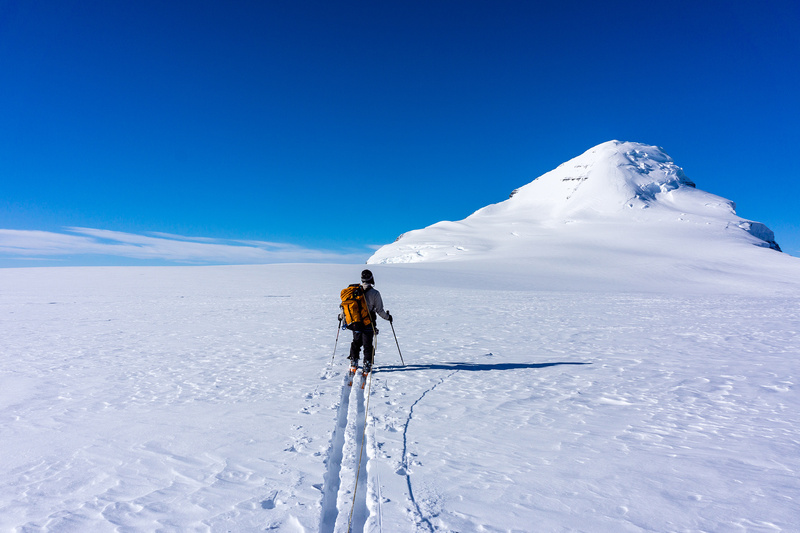 There’s about 5km of traveling from the trench to the base of Mount Columbia and by the time we were finally within striking distance of the giant peak we were both more than ready to take our skis off and start kicking steps up the east face. Approaching the trench. Columbia on the left (at least 6km away at this point) and the Twins on the right. 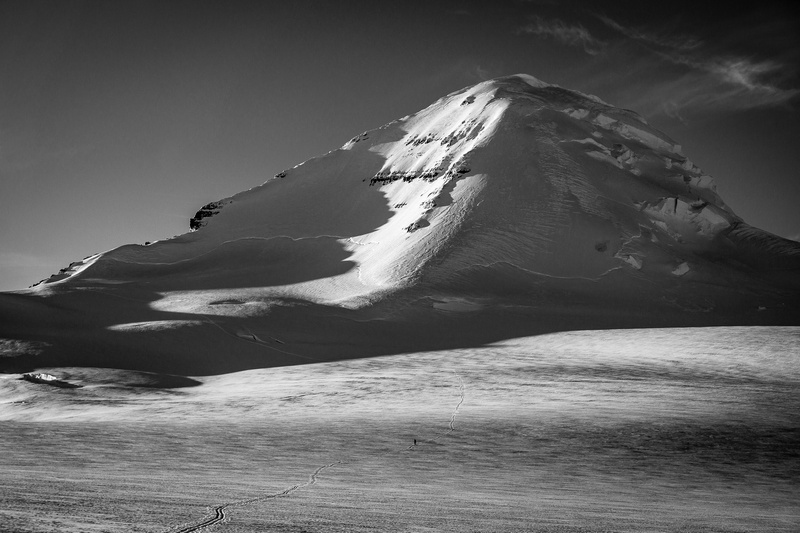 The east face was looking very much like the same snow we’d been skiing on for the past 4 hours – well bonded (i.e. low avalanche risk) but reasonably deep. We knew that we’d be sinking for sure calf, if not knee, deep on the entire east face slope and the ‘schrund didn’t look completely filled in yet either. We hummed and hawed about it (mostly using the decision as a break from trail breaking), and eventually we concluded that trying the southeast ridge would be the most realistic shot at a summit for us. We reasoned that the west winds would have packed the snow on the ridge or at least blown it clear so we’d have a much easier time ascending it than the east face. 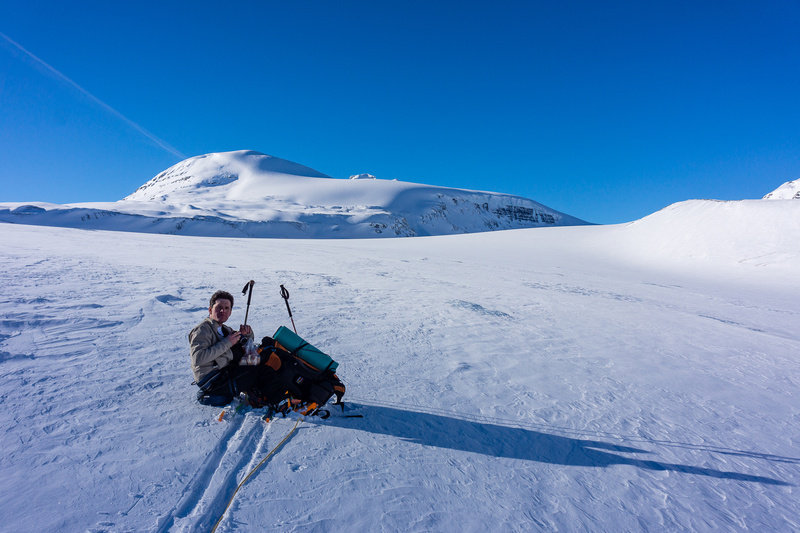 The only ‘problem’ was that now we’d be on skis longer – more trail breaking! 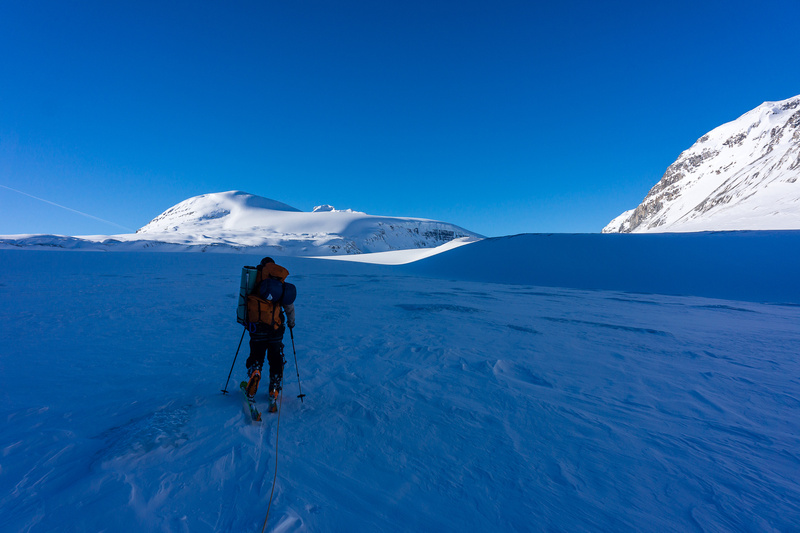 We skied up to the south ridge, traversing underneath the south face of Columbia on the way – a giant brooding face of ice and snow with a ‘grin’ of a bergschrund splitting across it’s entire width. 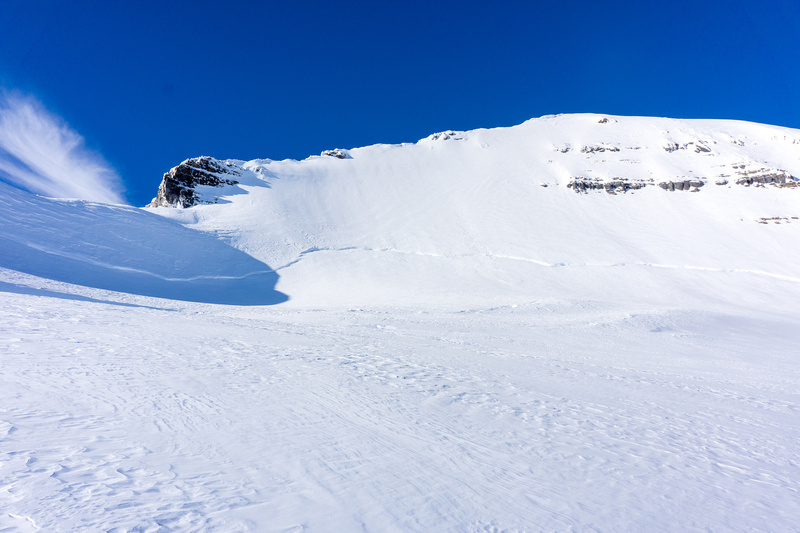 We assumed that the ‘schrund stopped at our ridge since it didn’t look to break over it. Stunning views to the south towards the north face of the Lyells. As we gained height on the approach we heard a jet engine behind us to the south, near Mount Bryce. Passenger jets were flying overhead all day but this sounded a lot closer and a lot louder than those. Then we saw the coolest thing I think I’ve ever witnessed while in the mountains. 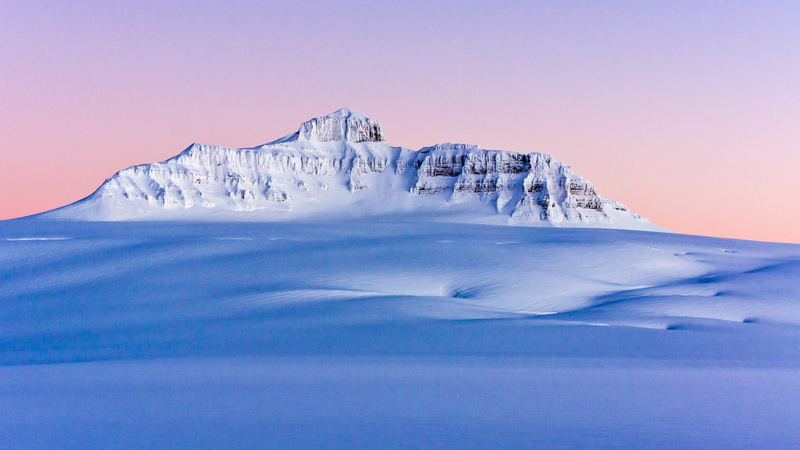 A fighter jet came screaming in from the west, between us and Bryce, no more than 100 meters over the icefield, banked a hard left turn between Mount Andromeda and Columbia and dove down the trench (Columbia Glacier) under the towering walls of North and South Twin and vanished! We both stood there, not quite believing our eyes! What a cool thing to see. I’m glad we weren’t underneath it though, it was LOUD. Views down the Bush River Valley with Mount Bryce, Cockscomb and Rostrum looming over it. 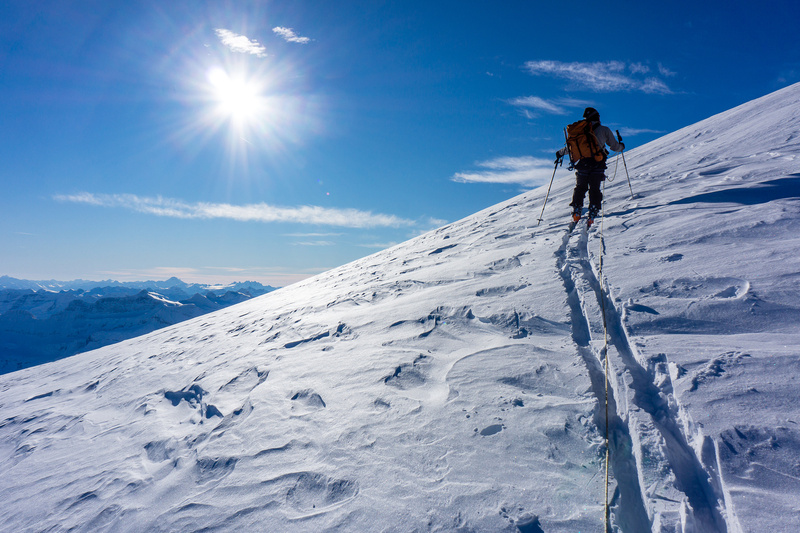 Once off the skis, Ferenc regained his energy and began an enthusiastic charge up the steepening ridge. The snow was absolutely perfect, our kick steps were solid and just deep enough to give confidence. Ferenc shouted down to me that, “we might actually make the SUMMIT!!”. I was starting to agree with him – I honestly didn’t consider it before that moment – until Ferenc started to mutter to himself above me. I was going slow, taking pictures of Bryce and the cloud-filled valley as I ascended so at first I just thought Ferenc was going through some soft snow but then I realized he was stopped and was doing weird gymnastics with his ice ax. 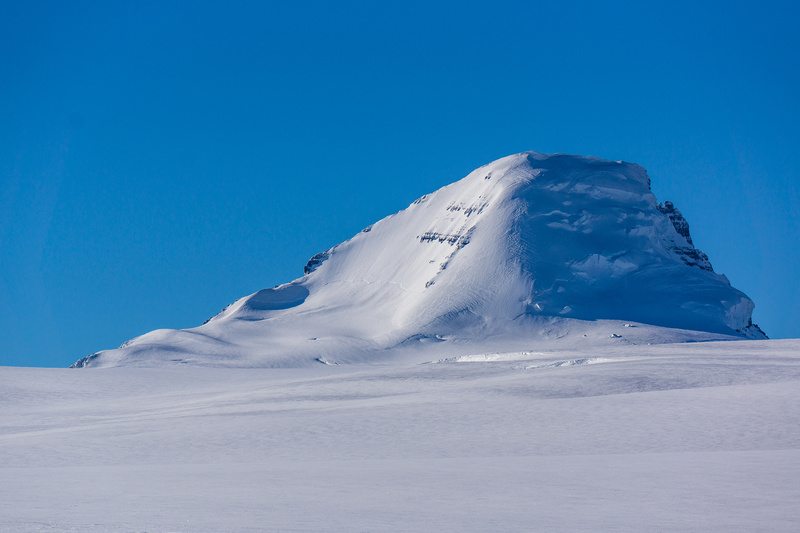 We had run into the ‘schrund, which apparently goes right through the southeast ridge rather than stopping at it. Looking back from near the SE ridge on Columbia. 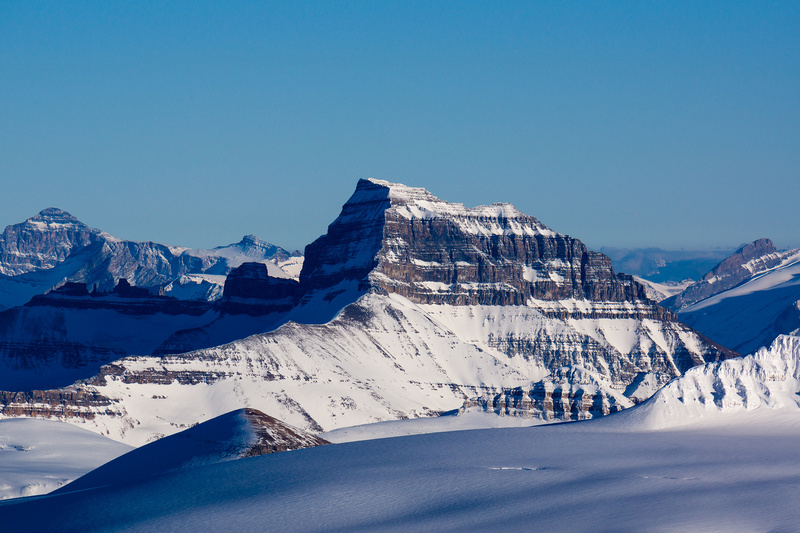 Peaks include Snow Dome, Andromeda, Saskatchewan, Forbes, the Lyells and Mount Bryce. I was amazingly OK with turning around. 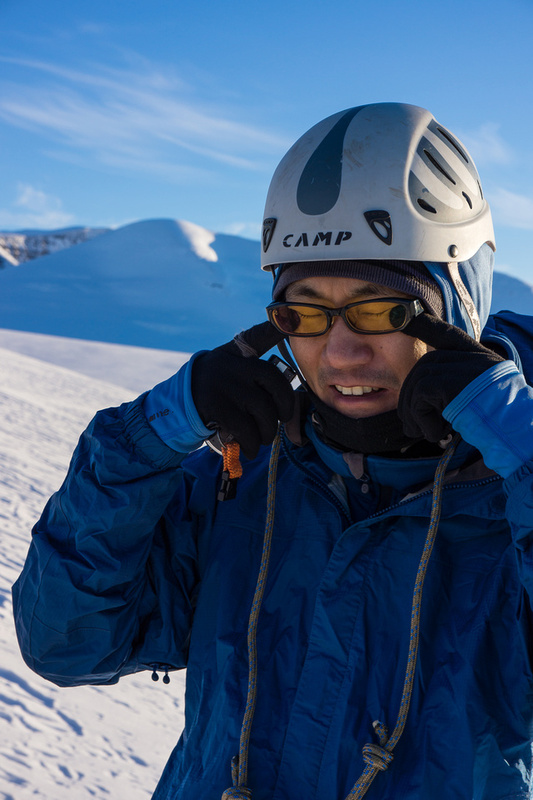 It’s not that I was so tired I couldn’t keep going, my energy was coming back now that we were off the skis. 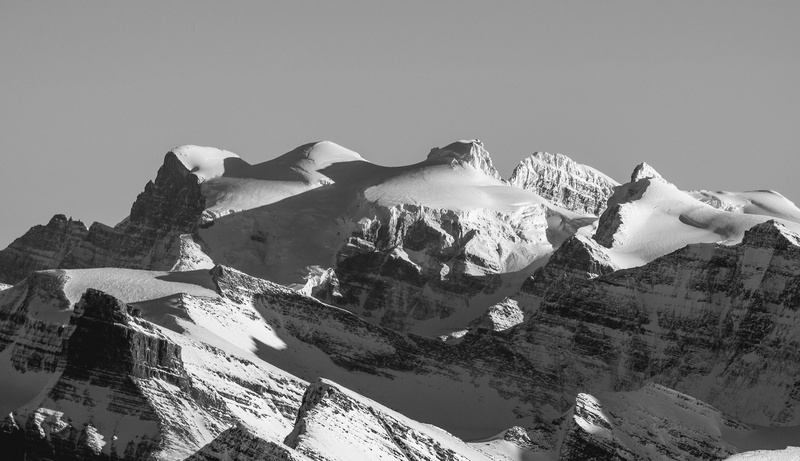 I just realized how lucky we were to be out in the middle of nowhere – two guys climbing high up on Alberta’s highest mountain with 11,000 foot views all around us. 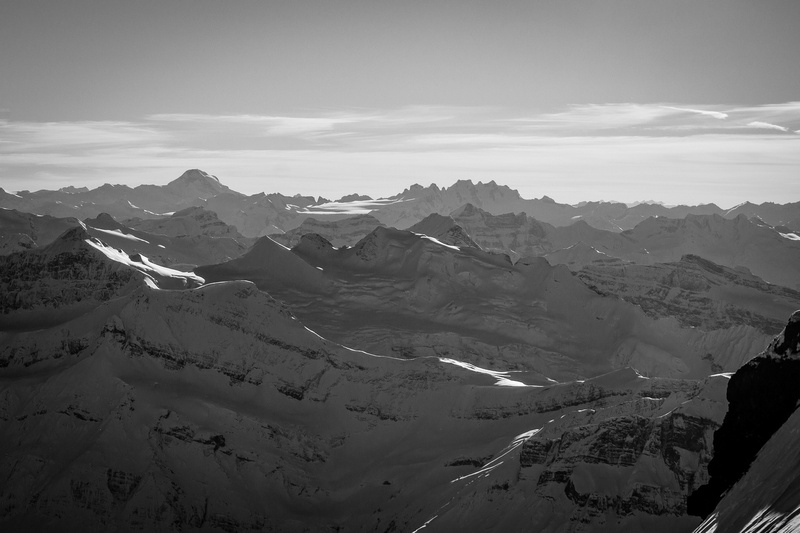 Everywhere we looked there were waves of snowy mountain tops with cloud-filled valleys beneath. The sun was warm, the wind was light and the sky was a brilliant shade of winter blue. 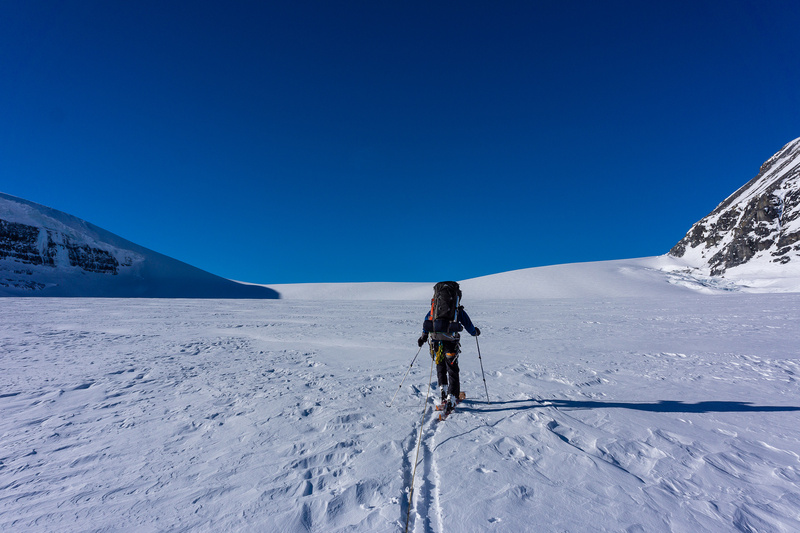 The only sign of humans was the faint winding thread of our approach track disappearing into a white void of rolling ice and snow. I’m glad that I get to back to that place again some day and feel privileged that I’ve been there in such great winter conditions. Looking up the south ridge and across the immense south face of Mount Columbia. Note the bergschrund splitting the face. The ski back to camp was great! As I did little kick turns down the trench I tried to freeze the moment into my brain. The rising moon over Andromeda, the cool breezes blowing through the trench, the setting sun on Bryce and the Twins – it was a sublime moment for me. It was good to be alive. 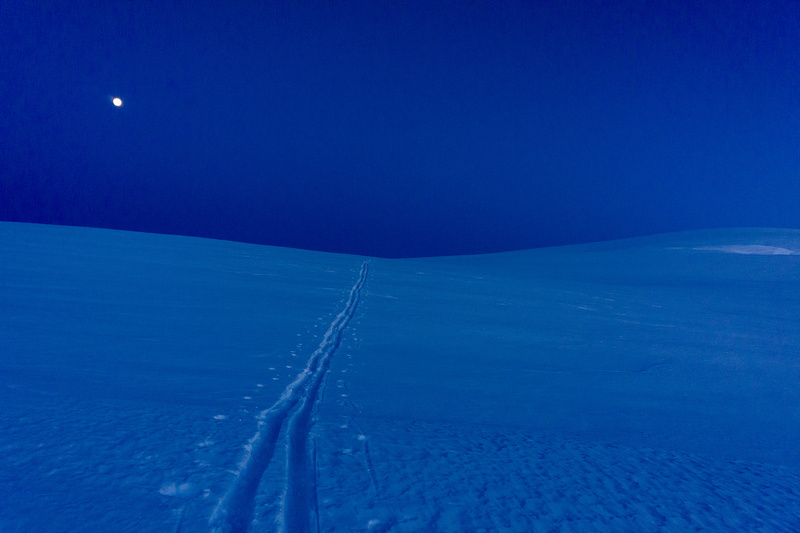 Reality hit on the way back up the other side of the trench but after topping out it was a nice easy ski back to camp. So had his headlamp flashing near the tent to give us a ‘beacon’ and it was a nice touch! It was a little depressing to see the flashing light from over 3 km away. 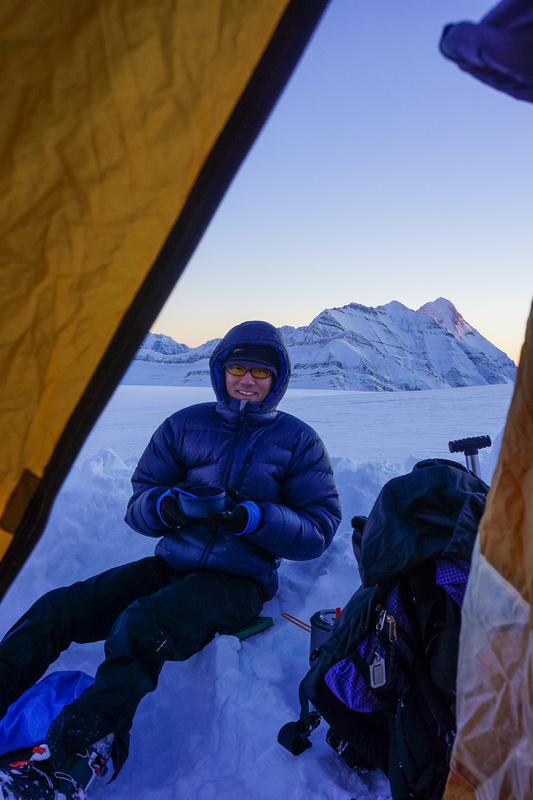 Ferenc got into camp shortly after me and we both agreed that it was a fantastic day even though we were denied a summit. Looking back at the beautiful giant – note the tiny Ferenc following my tracks. Panorama of Mount Bryce, the Bush River Valley and part of the Chess Group (R) while re-ascending the trench after sunset. We decided to get up at 03:45 on Monday morning for an attempt of Castleguard Mountain to hopefully garner at least one summit for all our winter camping efforts! After boiling water and eating supper we turned in around 21:30 – my alarm was set this time. Looking back over a massive hole with Androlumbia at left. Another panorama from the east side of the trench. Bryce on the left, Columbia in center and the Twins on the right. South Twin with Sundial in the distance. Looking down into the trench. Bryce at left, Columbia at distant right. Vern breaks trail towards Columbia, which is slowly getting larger. Key word is SLOWLY... It's still about 5km away at this point. Looking back over the trench to the Twins, Stuts and Kitchener (R). The giant never seems to get closer. A nice-sized hole sitting below the normal ascent route (east ridge) on Columbia. Breaking trail to the south ridge. Gorgeous views past Bryce to Cockscomb and Rostrum. Looking up the south face of Columbia. Almost at the South Ridge. 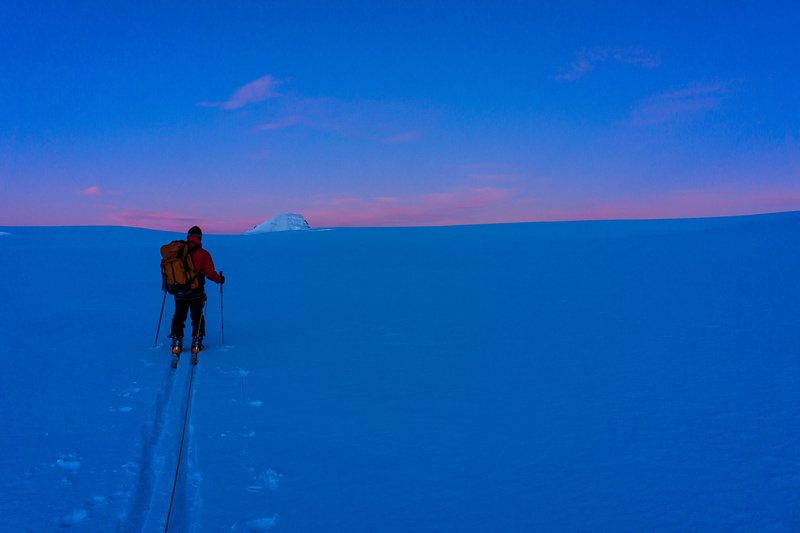 Ferenc breaks trail onto the south ridge of Columbia. 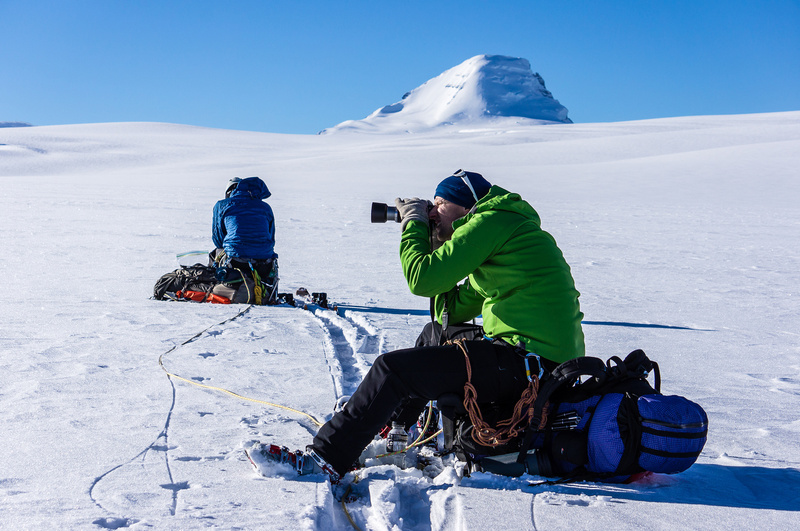 Vern with our approach track, the trench and mounts Andromeda and Athabasca - which I'd climb in 2014 with Ferenc - in the background. Looking way back over our approach. Feeling good! At this point we thought we might actually make the summit! Ferenc kicks steps up the firm southeast ridge. Ferenc breaks trail up the south ridge. Views back over the trench include Androlumbia, Andromeda and Cirrus. Looking back towards the Saskatchewan Glacier. Castleguard is much lower than us now. Lyells, Bryce, Cockscomb and the Chess Group. Look carefully how deep this goes. Now remember, we're on a 35 degree slope with softening snow and there's another slot just behind this one. And that's the end of this attempt! 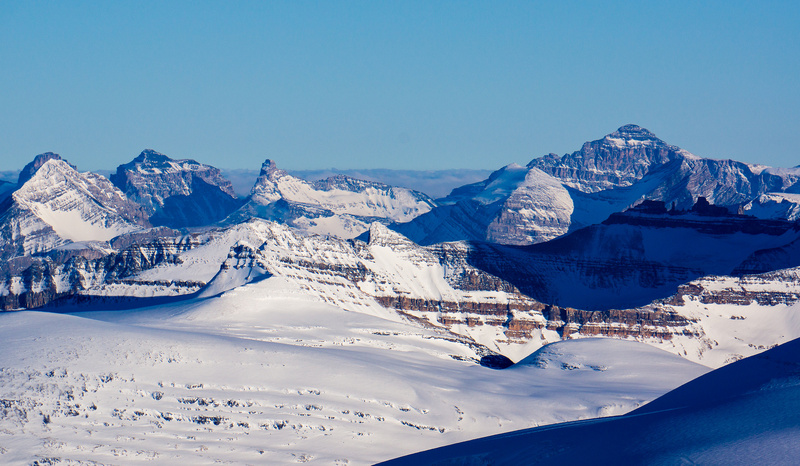 Snow Dome, Athabasca, Andromeda, Castleguard, Saskatchewan, Lyells, Bryce and many, many other peaks are visible. Looking west over the Chess Group to Sir Sanford and the Adamants. The approach meadows for King Edward at lower left here. 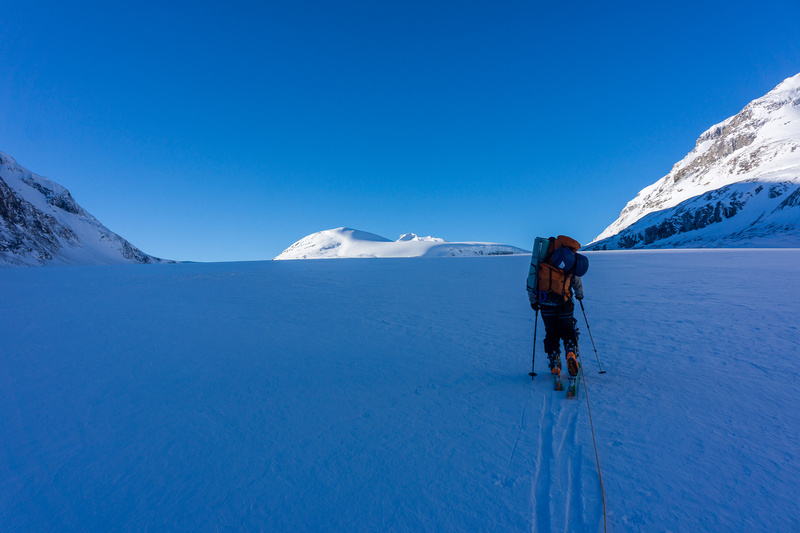 Descending back to the main icefield. Mount Cline and the White Goat peaks. The north face of the Lyells with Farbus at right. The giant east ridge and south face of Mount Columbia. Find Ferenc. The long ski back to camp. All five Lyells visible with Oppy at right. Castleguard in front of Mount Saskatchewan. 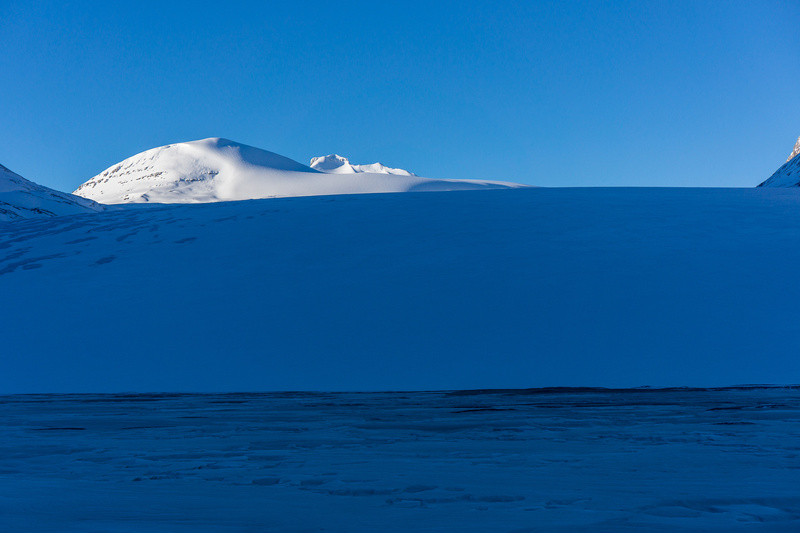 Panorama of Mount Bryce while re-ascending the trench going back to camp. 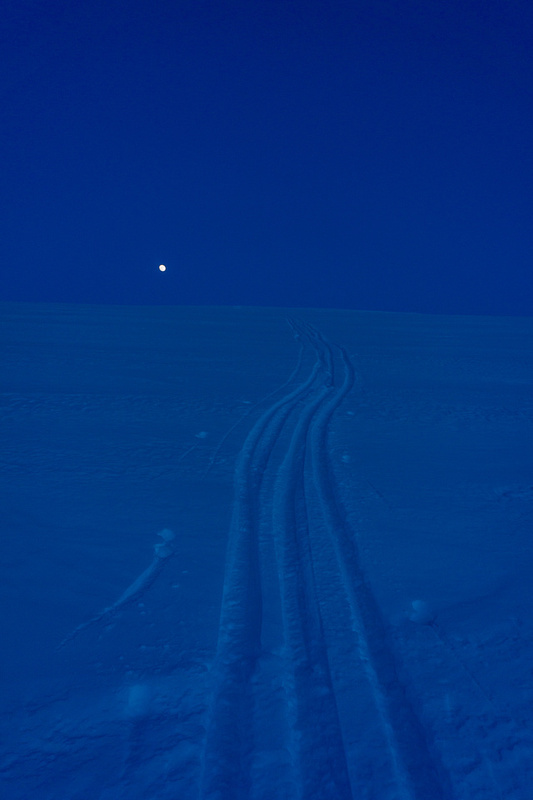 The moon rises as I come up the trench on the way back to camp. The night is still utterly calm and warm as we make our way out of the trench back towards camp. Views back down the Bush River Valley from the top of the trench at sunset. I was up before my alarm, feeling pretty good and ready to tackle Castleguard. Ferenc was a bit tired but agreed to give it a shot. Before long we were making our way to the mountain. Clouds were hanging over various bits of the icefield but we weren’t too concerned for the moment. This quickly changed about 1 km from camp. As we were skinning up for the ascent we noticed a low bank of cloud coming in from the north between Columbia and Andromeda. I knew that our attempt was over. 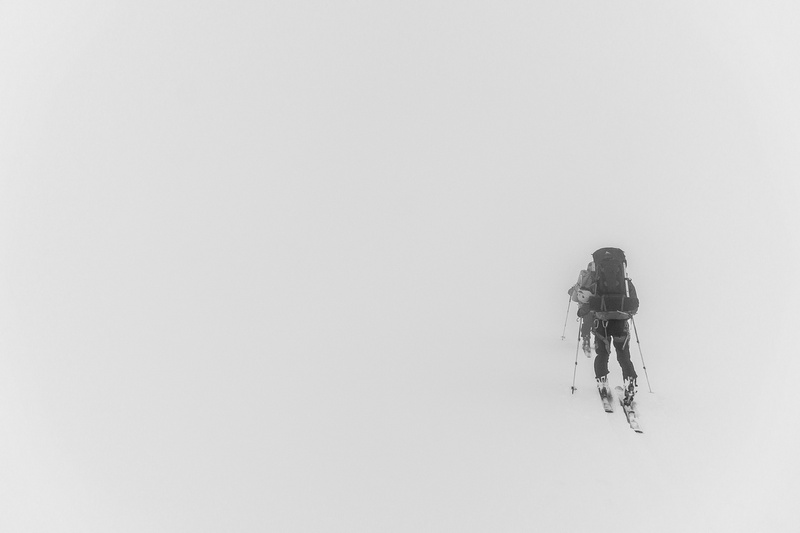 Any low cloud on the icefield means a complete whiteout and sure enough! Soon we couldn’t see more than 20 or 30 feet in front of us! We reluctantly plodded back to camp, reversing our approach track. 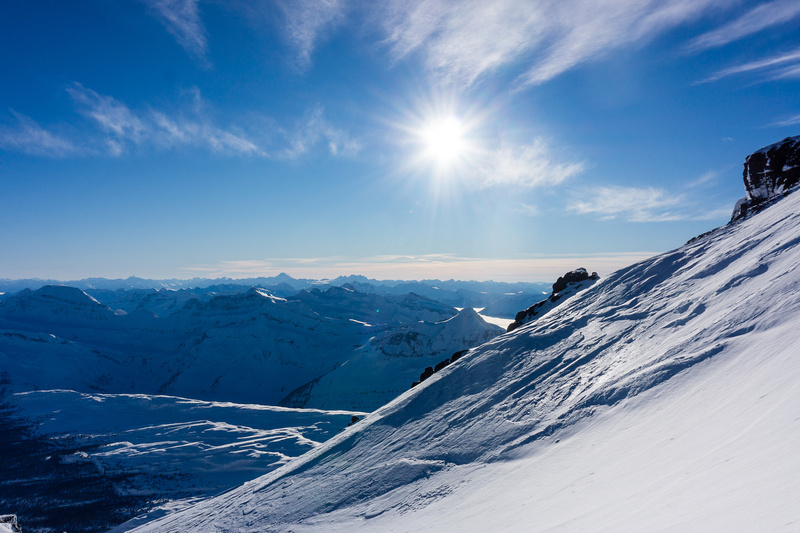 This is the definition of “skiing in a ping-pong ball”. 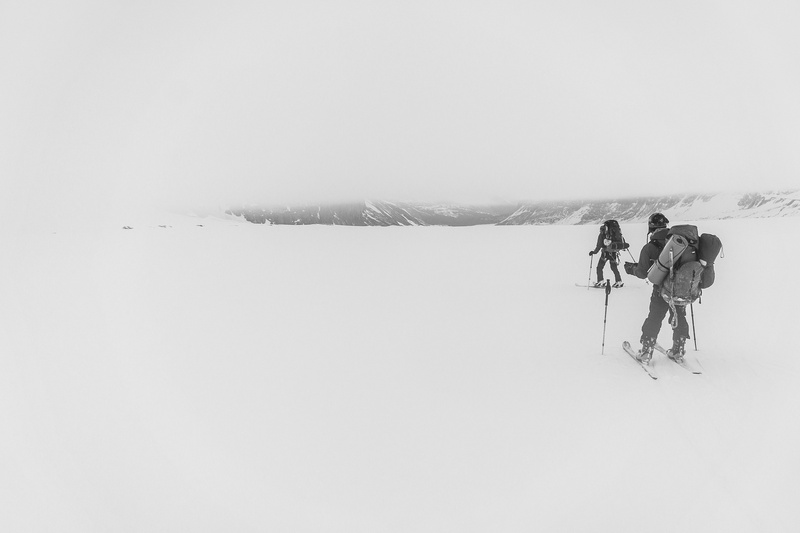 Descending the Saskatchewan Glacier from our camp in a complete “cloud-out”. 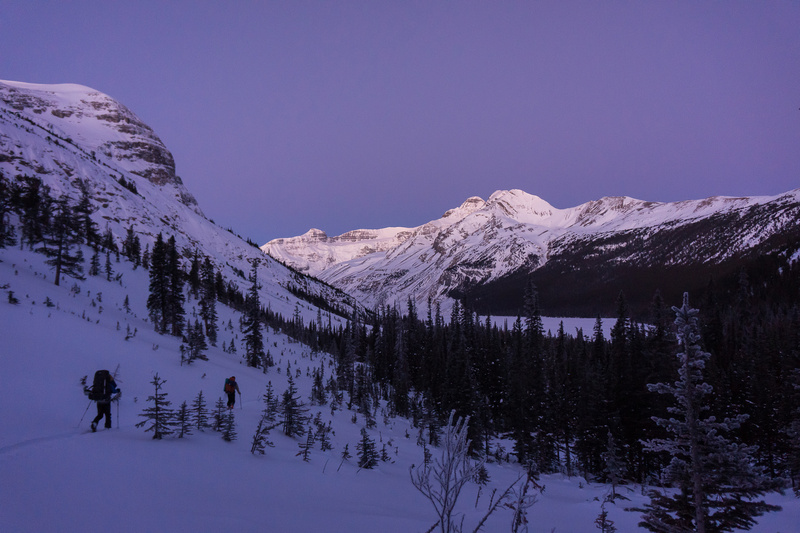 Ferenc dove back in his warm sleeping bag while I hung around camp for 2 hours waiting for sunrise. My new down jacket certainly came in handy for those hours! Eventually daylight came and the whiteout was even worse. 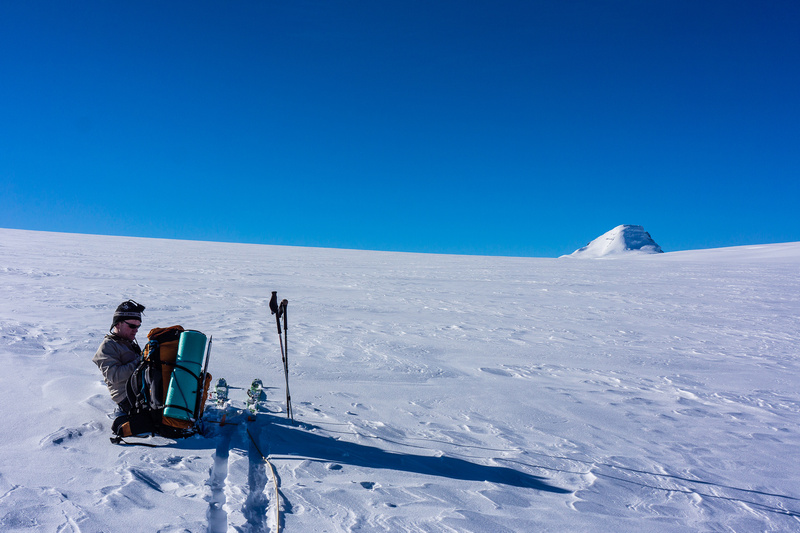 We took down camp and shouldered our heavy packs for the ski out. 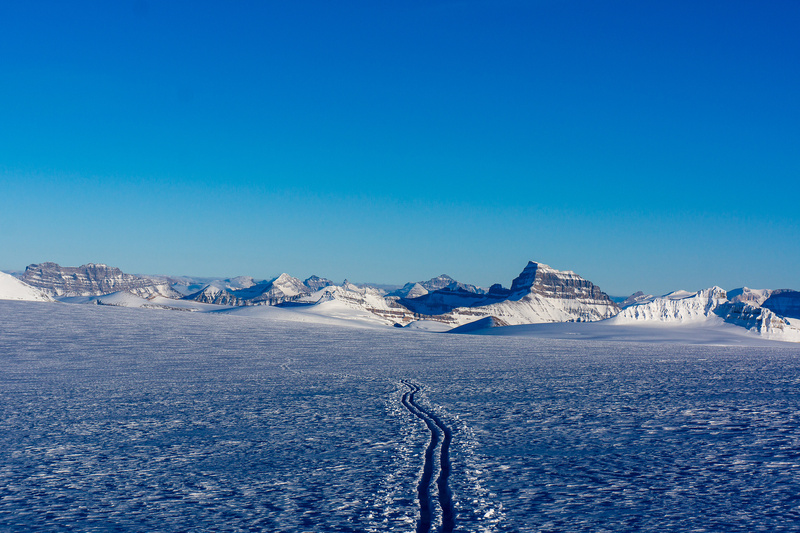 Following our tracks back down the Saskatchewan Glacier proved quite difficult. 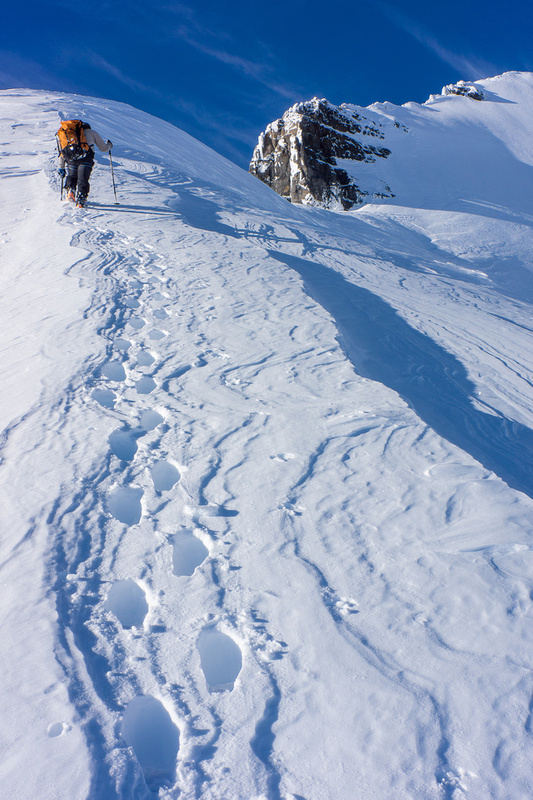 We were in a world of white and gray – it was almost impossible to make out the little ridges of our ascent tracks! Eventually we started to dip under the clouds and soon we were back in a world of towering peaks and blue sky with puffy white clouds. The ski back out to Big Bend was relatively easy and fast. We descended below the clouds to a picture perfect day. Here we are almost back at the toe of the Saskatchewan Glacier. 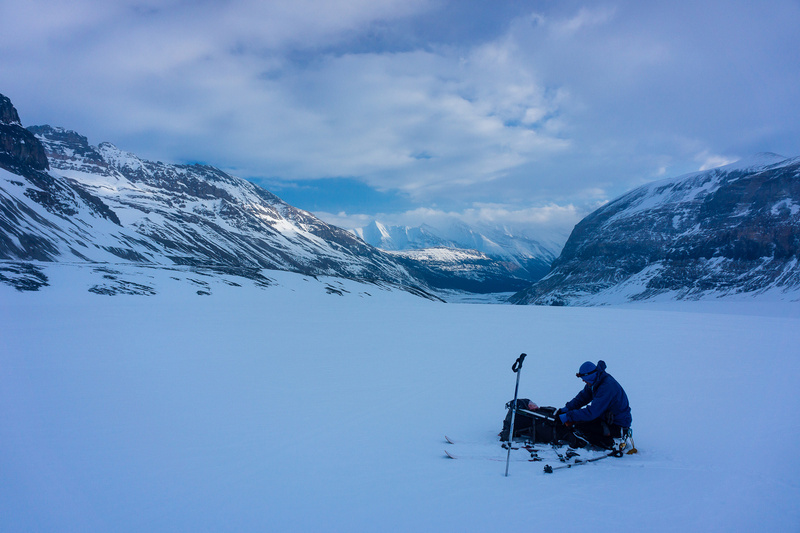 My impressions of this trip are that we learned a lot about winter camping in general and traveling on the Columbia icefields in particular. It was a great time with good friends in one of the most spectacular areas of the Rockies. I’ll be back! Our views are gone! Packing up camp. 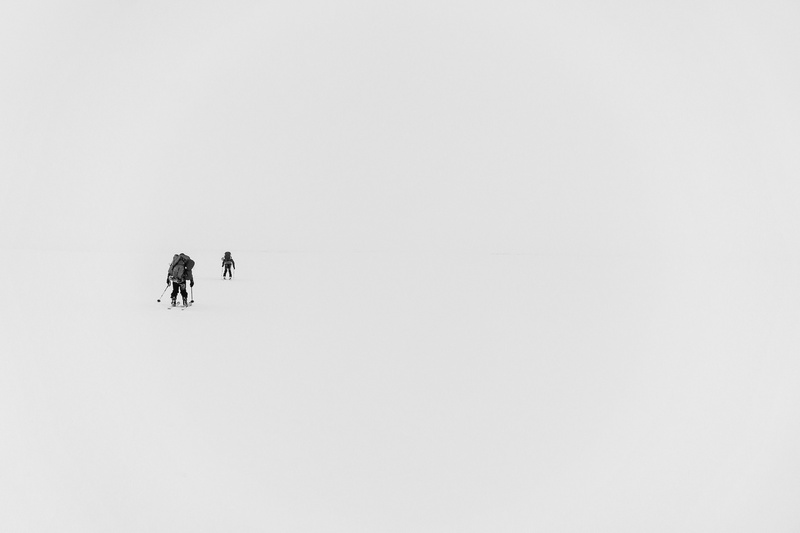 Leaving camp in a whiteout. Skiing in a ping-pong ball! Slowly skiing under the cloud cap. The clouds clear as we descend the Saskatchewan Glacier. 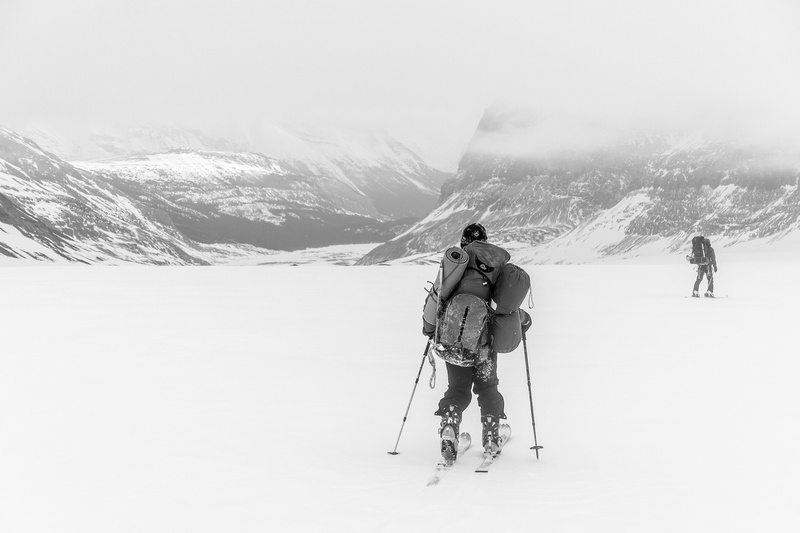 Skiing down the Saskatchewan Glacier. 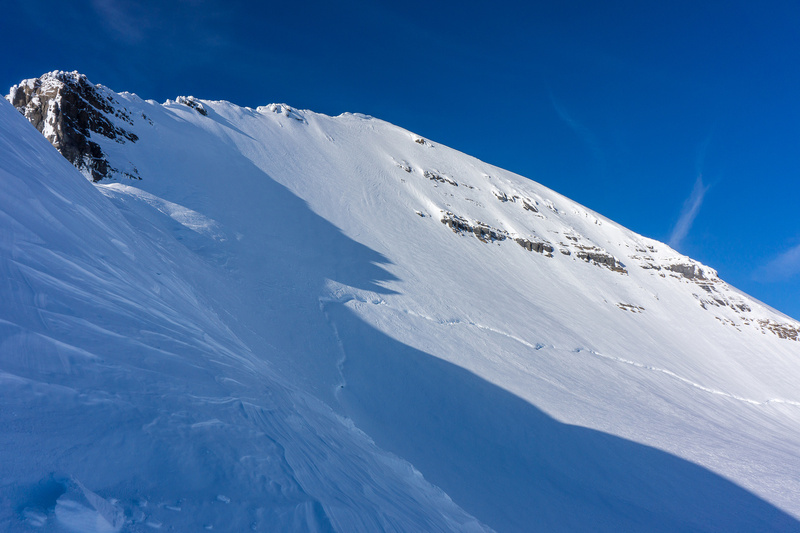 A rare section of the Saskatchewan Glacier that was steep enough to do turns on! Looking back at the Saskatchewan Glacier. 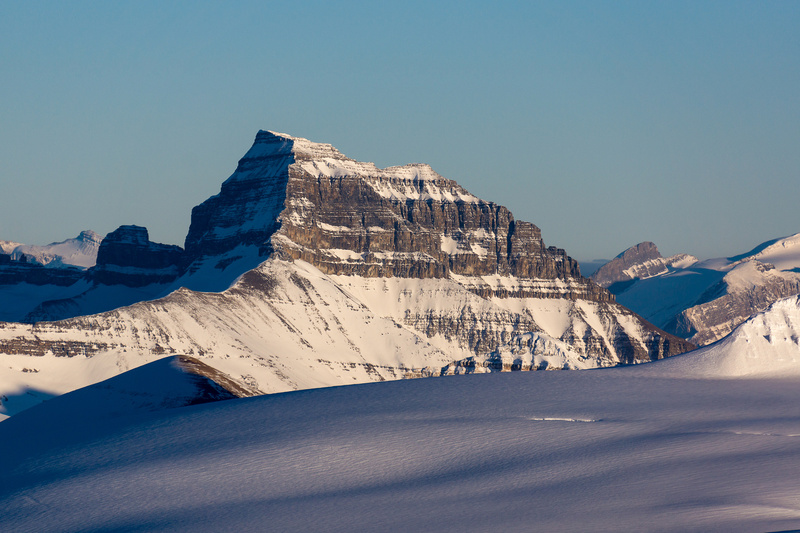 So and Ferenc come off the Saskatchewan Glacier with an outlier of Mount Andromeda towering above them. So and Ferenc approach the Big Bend parking lot after crossing the North Saskatchewan river. At the Big Bend Parking spot.